There will be a popcorn sale this Friday, April 26. Cost is 50 cents a bag, limit 2 bags per student please. Proceeds this week go towards the 2nd grade class. Youth baseball/softball players and parents will have a mandatory meeting on Sunday, April 28th, at 6pm in the Commons. All players should attend with at least one of his/her parents. Attn Students in Grades 3-12: There will be a PTSO Game Club night on Thursday, April 25 from after school until 5 PM. We will meet in the commons for a healthy snack and then go to the Multi-Purpose room for games. See you then! Just a reminder: 9th Grade: ACT Aspire Testing will take place for you Wednesday morning and Thursday afternoon this week. 10th Grade: ACT Aspire Testing will take place for you Wednesday afternoon and Thursday morning. See Ms. Bevan if you have any questions. Good Evening, Due to the Boscobel meet being postponed the North Crawford Varsity Track meet scheduled for April 23, 2019 has been cancelled and will not be rescheduled. 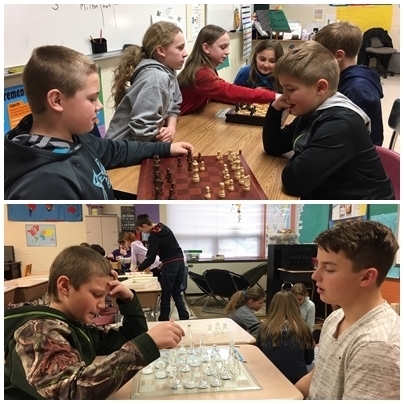 Chess is seeing increased popularity at our school. 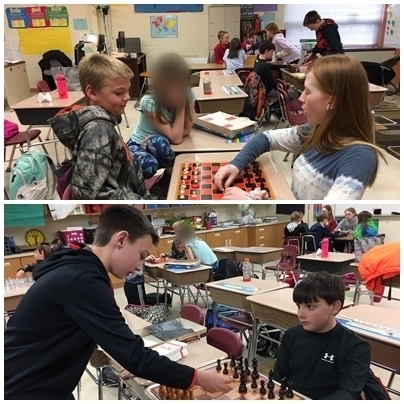 Some 7th graders recently taught skills to Mrs. Huffar's 4th grade. Please come and support the Ithaca School Grounds Improvement Committee at Culver's Share Night on TONIGHT from 4-8:00pm. A portion of tonight's profits will go to fund these great projects. Tonight's JV baseball game against Seneca will start at 4:30 pm today. This game is at Ithaca. FCA Huddle! Thursday 4/18/19 Breakfast, fellowship & a powerful FCA devotion on “The Eternal Purpose.” All middle school & high school students are welcome! 7:00am FACE room! 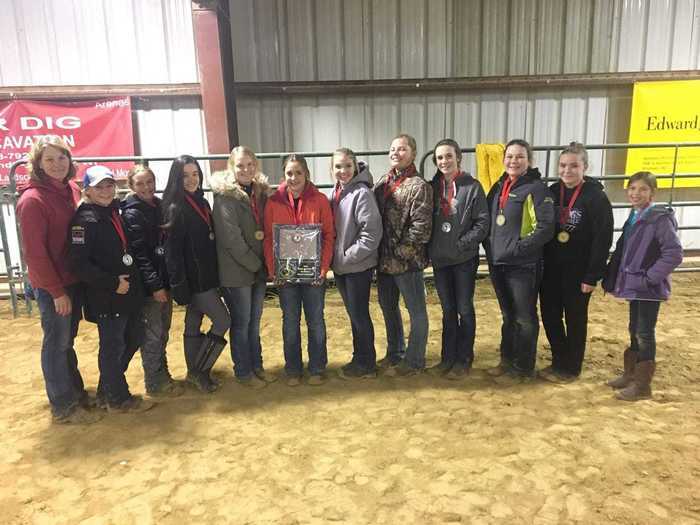 Congratulations to the following FFA members and teams at the recent UW Platteville Regional contest: For Horse Evaluation: Placing FIRST PLACE out of 169 contestants was Brianna Granger, The Team placed 20th out of 49 teams (the other team members were sister Brooklyn and Sara Jones) In Wildlife Management: Jonah Marchwick placed 3rd out of 146 contestants. The team also placed 7th out of 44 teams. Other team members were Caleb Scallon, Charlie Jones, & Jimmy Clary. The Livestock judging team placed 17th out of 44 teams. Team members were: Colton Clary, Logan Clary & Alexis Kast. In Farm Business Management Zach Nelson placed 9 out of 21 contestants And in Meat Evaluation: McKenna Muckler placed 16th out of 62 contestants. In celebration of National Teach Children to Save Day, The Money Bunny from The Richland County Bank hopped over to Ithaca to visit the second graders. He and his assistant taught the students valuable lessons about saving and spending money. These economic lessons will be important life skills for the future. Reminder: We will be doing the 9th/10th grade state required ACT Aspire Testing on Wednesday, April 24th and Thursday, April 25th. Students will be returning to classes if they are done early with tests. Thank you for your flexibility. -A student patio -A student ampitheater -Additions and improvements to the playground All ideas for upcoming outdoor improvements!! Please come and support the Ithaca School Grounds Improvement Committee at Culver's Share Night on Wednesday, April 17 from 4-8:00pm. A portion of the night's profits will go to fund these great projects. 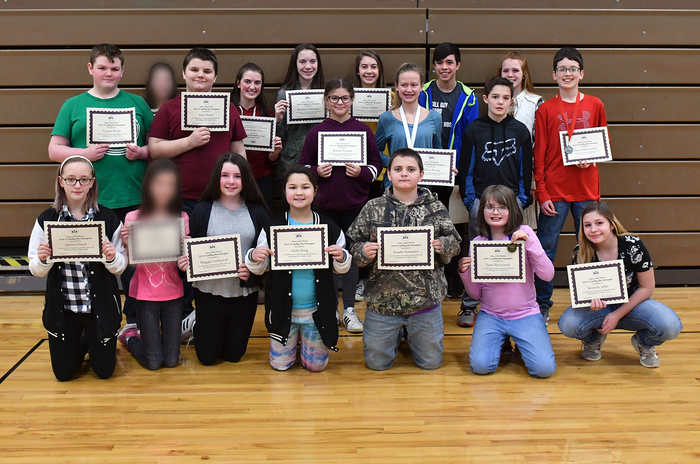 Congratulations to our High School and Middle School Honor Roll students. Well done! Congratulations to the 6th grade Destination Imagination Improv team - Ilana, Sammy, Maggie G., Holly, Tristen, Trista, and Xander S. - on a fantastic season! Though it ended at state on Saturday, I am proud of the improvement, grit, and teamwork you've shown over the past few months. It was an honor to be your manager and I'm looking forward to next year- Mrs. Plonka. Attention all NHS members: There will be a meeting in Mrs. Wontor's room during ATTACK time on Tuesday, April 16. Please attend. The April PTSO meeting will be held on Wednesday, April 17 at 3:30 p.m. in the LMC. Babysitting will be provided. We hope to see you there! Calling all crafters! And those who have rummage items to sell. Ithaca Horse Club is having a "Rent-A-Table" Event on Saturday, May 4, from 8am-1pm in the Community Gym. For $25, you can display your wares. Concessions by the Horse Club will be available. Set up will be Friday, May 3, from 6-8pm or Saturday beginning at 7AM. Reminder to Band Students and Parents: There will be an informational meeting about the 2020 Band Trip to Florida on Sunday, April 14th at 2:00 pm in the Commons. All band students going on the trip, including parents, should plan to attend. Saturday Track Change! "Due to the current conditions at our track and the forecast for tonight/tomorrow, we will have to cancel our meet. We will not be able to reschedule due to how full the rest of our schedule is." Due to wet grounds and cold conditions, the Ithaca baseball tournament has been cancelled. This tournament was scheduled for this Saturday April 13, 2019. Melanie Lendosky is an area mom whose daughter found a great outlet that builds confidence and enhances strengths. Read her story, and watch their group tomorrow! My daughter started playing wheelchair basketball this last fall/winter. She was born with Spina Bifida. The program has made such a difference in her self-confidence and also physically. Because of this, I am trying to get the word out to other families with disabled children and also to special ed directors/teachers etc. I hope it is ok that I went to the contacts that I have made at school districts because you know kids or at least special ed directors/teachers or maybe even families affected. The team she is playing for is the Mad City Badgers. They put on demonstration by scrimmaging the varsity teams of school districts. As part of the demonstration, the coach also includes disability awareness. We are putting on a demonstration this Saturday from 4-8 pm at Hillsboro high school. You can also find out more information on their facebook page, Mad City Wheelchair sports. Forensics Students: Good Luck at State tomorrow! Meet in the commons at 8:00 a.m. Dress for chilly weather and bring money for lunch on the way back. We will return at 2:30 or 3:00. 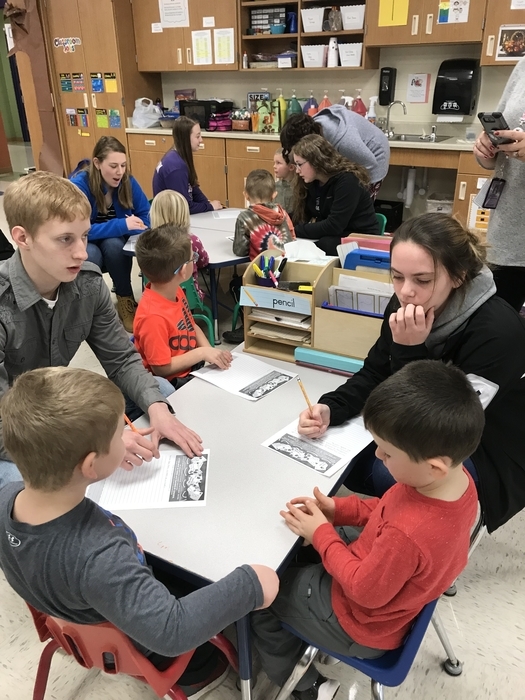 Good luck to Ilana Bloczynski, Maggie Gschwind, Holly King, Tristen Peterson, Trista Pluemer, and Xander Sorenson who will be participating at the state Destination Imagination competition tomorrow at UW-Green Bay. 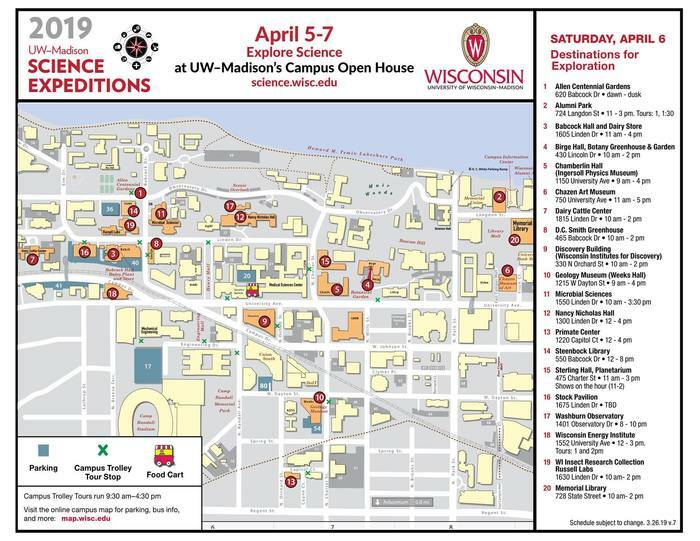 Good luck to John Clary, Anna Dahlke, Lincoln Manning, and Kyla Pluemer who will be participating in the state "You Be the Chemist" competition tomorrow at UW-Madison. Our JV game with Royall tomorrow has been postponed. We will try to reschedule the game. TONIGHT's baseball and softball games have been postponed. A makeup date has not been planned as of now. Tomorrow's scheduled softball game at Seneca is postponed to May 7th at Seneca starting at 5:00pm. If you are detail-oriented, can use basic computer programs and are organized, AND looking for a long-term job, stop in to Ms Schoen. Local company is looking for an individual with these skills/traits. The deadline to order Middle School and Elementary yearbooks has been extended two days, Thurs, April 11th and Friday, April 12th. Last chance for Middle School Yearbooks. You can order two ways. Online at www.entourageyearbooks.com or pick up a form in the office. Congratulations to McKenna Muckler on being accepted to UW-Platteville's Health Career Camp this summer! McKenna was one of the 30 people selected out of 80 applicants to attend this camp. Way to go McKenna! The annual K-12 Ithaca Art Show will be Tuesday, April 30th in the Ithaca Commons from 3:30pm until the time of the band concert. Art work from all grades will be on display in the commons up until the time of the Spring Band Concert. Junior Class: There will be a Jr. Class meeting on Friday during Attack time in the Band Room. There will be a popcorn sale this Friday, April 12. Cost is 50 cents a bag limit 2 bags per student. Proceeds this week will go to the 1st grade class! Ithaca's annual Camp Bulldog (summer enrichment program) is scheduled for the week of June 10, for students entering K-8th grade. This announcement form is simply general information to "save the date." Registration forms will be sent out later, after more details have been finalized. 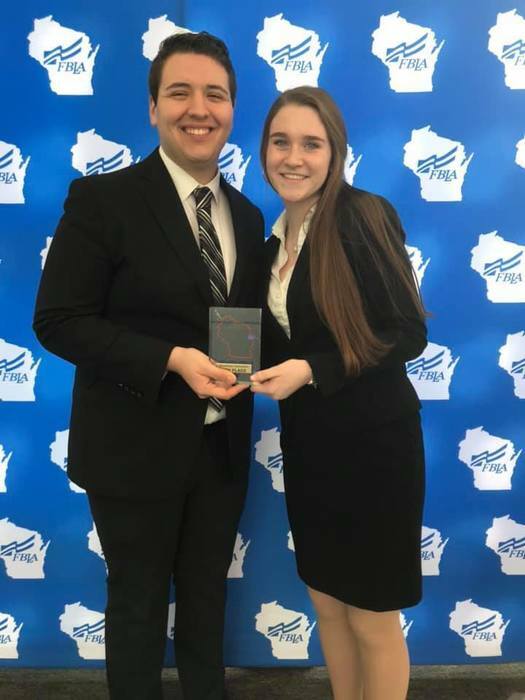 Congratulations to the team of Julia Schoen and Diego Ortiz on receiving 4th place at State FBLA and the team of Aubrey Newkirk and Emma Schoen on receiving First place. Both teams have qualified for Nationals which will be held in San Antonio at the end of June. We are all so proud of you! Hey! Guess what's happening here at Ithaca? Big plans. Big BIG plans! Construction plans. What are they? 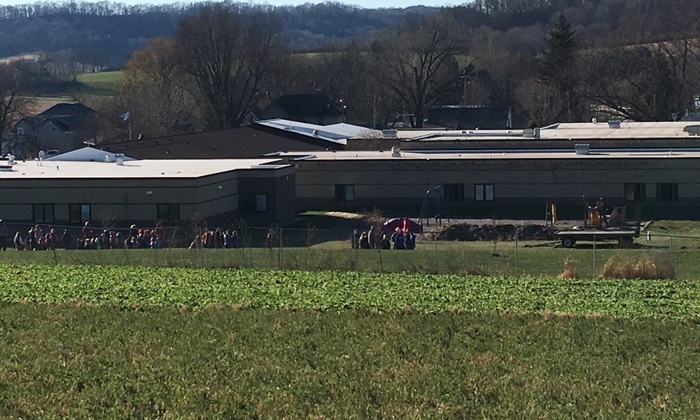 -A student patio -A student ampitheater -And additions and improvements to the playground. Sounds great, right? Here's how you can help! Please come and support the Ithaca School Grounds Improvement Committee at Culver's Share Night on Wednesday, April 17 from 4-8:00pm. A portion of the night's profits will go to fund these great projects. Hope to see you there! TODAY is the last day to order your elementary and/or middle school yearbooks. Order forms were sent home with elementary students, extra forms are in the office for both books, and middle school yearbooks may be ordered online at: www.entourageyearbooks.com. Phone service has now been restored to Ithaca Schools. Thanks. Don't forget that tomorrow, April 10, 2019, Ithaca has an early release. Middle Students! Dig out Mom or Dad's old 80's gear to wear this Friday! Join us in partying on April 12, 2019 in the old gym from 6:00-9:00 p.m. General admission is $3 and $2 if you wear 80’s themed apparel. Hosted by Middle School Student Council. Way to go Ithaca FBLA! Band Students and Parents: There will be an informational meeting about the 2020 Band Trip to Florida on Sunday, April 14th at 2:00 pm in the Commons. All band students going on the trip, including parents, should plan to attend. The April PTSO meeting will be held April 17 at 3:30 p.m. in the LMC. Babysitting will be provided. We hope to see you there! A reminder that this Wednesday, April 10th is still an EARLY RELEASE. This schedule did not change with the added minutes and days. The deadline to order Middle School and elementary yearbooks is this Wednesday, April 10th. Middle School may be ordered online at www.entourageyearbooks.com or pick up a form in the office. Elementary forms went out with students on Friday, and additional forms are available in the office. Elementary orders paid by the deadline qualify for a drawing to be reimbursed their $15. Ithaca Middle School: Your yearbook theme this year is "Nobody's Perfect". There will be several mistakes in it, and if you can pick out the most, you could win a $10 Culvers gift card! Details to follow. Tomorrow's JV baseball game at Hillsboro has been postponed. If/when it is rescheduled, that information will be sent out. 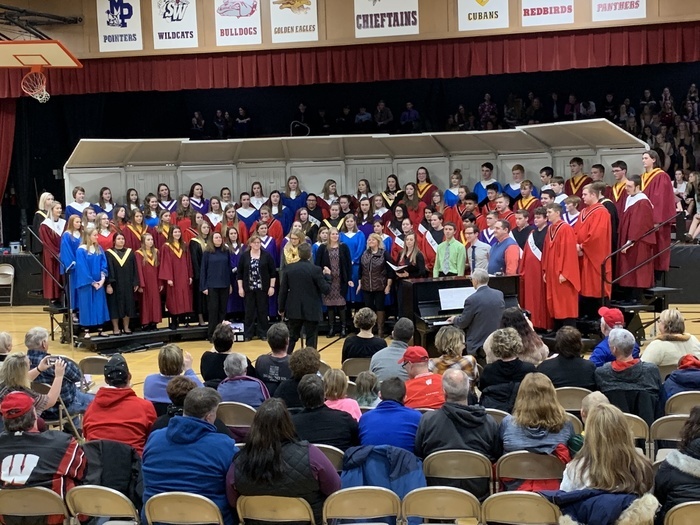 Congratulations to the High School Band and Choir students on their performances at solo/ensemble contest held at Fennimore HS this past Saturday. The students received 19 Starred Firsts, 7 Firsts, 9 Seconds and 1 Third. The students that received the Starred Firsts and qualifying for the State Solo/Ensemble Contest, are: Delaney Brown, Erin Miller, Carissa Willis, Emma Schoen, Kierra Atkinson, Mallory Kershner, Ira Coppernoll, Olivia Duell, Morgan Wiendfield, Aubrey Wiedenfeld, Ryan Ghastin, Aubrey Olson, Therese Honer, Serenity Clary, Paula Gomez, Julia Schoen, Alexis Kast, Shelby Funk, Ellie Crook, Haleigh Colson, Brianna Granger, Hannah Durst, Audrey Newkirk, Jacob Mueller, Haley Durst, Lukeus Mueller, Cortez Kleinsasser, Robert Ringelstetter, and Lucas Pluemer. A special congratulations to Erin Miller, who earned a Starred First in all of her 6 events! Don't forget that our FBLA competitors are starting this morning! Use this link to watch sessions: https://livestream.com/accounts/3291401/events/8561380 The schedule is as follows: Monday, April 8 - Opening Session at 8:30 AM Monday, April 8 - Legacy Awards Session at 9:30 PM Tuesday, April 9 - Executive Board & Voting Session at 7:45 AM Tuesday, April 9 - Closing Awards of Excellence Session at 3:00 PM Good LUCK! Your family is invited to join us for our Family Literacy Event which will be held on Tuesday, April 16. The event features local author, Tim Fox.The evening will include a free dinner beginning at 4:45 in the Commons sponsored by the PTSO. Tim's presentation will begin at 5:30 in the gym where he will create a life-size mastodon and you will learn about geographic features and Ice Age animals from Wisconsin. Each family will receive one of Tim's autographed books absolutely free, sponsored by the PTSO!! Reserve your spot by filling out a form, which was sent home with your child, by April 8th! There will be no weight room after school today. Elementary and Middle School yearbooks are now available to order! Elementary order forms went home last week. Middle School can be ordered online at www.entourageyearbooks.com or pick up an order form in the office. Deadline is April 10th! We are in need someone or a business that would be willing to plane some wood for an Applied Math class project. We are planing some cross-sectional pieces of tree trunk with a maximum diameter of 24 inches. Please contact David Triphan. Thank you! Seniors: If you are planning to attend UW Platteville-Richland in the fall, they have extended the scholarship deadline until Monday, April 8th. If you haven't already applied, do so by Monday. See Ms. Bevan if you have any questions. Please note there will be a Finance and Personnel Committee meeting on Monday April 8th from 6:00 PM - 7:00 PM in the School LMC. You may have seen this announcement with a different start time. Please be aware the CORRECT start time is 6:00 PM. Meet author, Tim Fox! Register by Apr. 8th for Family Literacy Night. Free dinner at 4:45. Tim presents from 5:30 until 6:30. 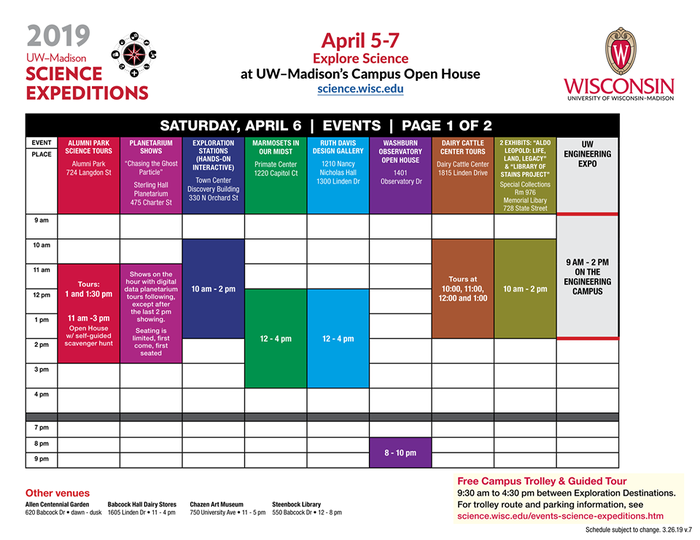 Create a life-sized mastodon, learn about geographic features and Ice Age animals of Wisconsin. Each family will take home a copy of one of Tim's books. Fellowship of Christian Athletes...’FCA Huddle’ this Thursday April 4th- 7:00am. Join us for breakfast, an encouraging devotion/message and fellowship! All middle school and high school students are welcome to attend. Hope to see you, bring a friend! High School Student council will meet on Monday, April 1st. 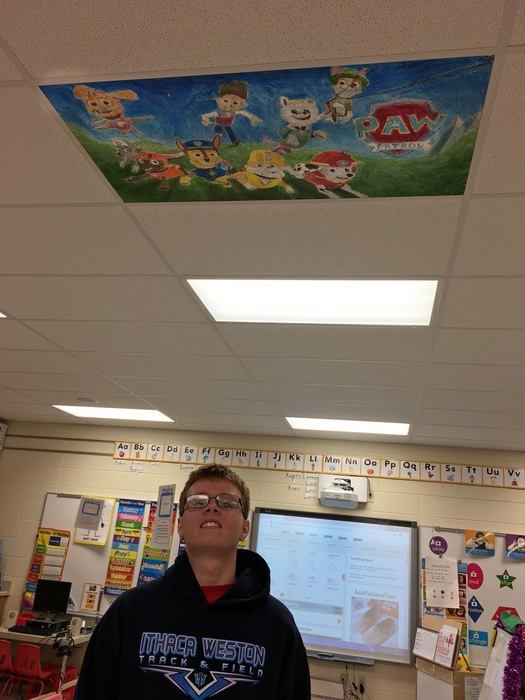 during ATTACK in Ms. Sprecher's room. This is a reminder that the youth and middle school wrestlers have an end-of-the season party on Sunday, March 31 from 4:30 - 6 p.m. in the Ithaca school commons. We have gear return that evening as well. Please remember to bring any singlets or shoes that you have borrowed from the club. All parents, grandparents and supporters are welcome to attend. Please bring a salad or desert to share. FRIDAY is a FULL DAY! Just another reminder that tomorrow is now a full day of school to help make up lost time during the winter. Ithaca has a new front entrance sign! Elementary and Middle School yearbooks are now available to order! Elementary order forms will be going home in Friday folders. Middle School can be ordered online at www.entourageyearbooks.com or pick up an order form in the office. March of Dimes donut day is back! The famous FBLA donuts will be sold this Friday for $1.00 during ATTACK (after breakfast) and after lunch is served. Bring your money and help the FBLA support the March of Dimes. Spring time in the air brings...DAIRY JUDGING? It does for our Throwback Thursday picture. Here is an Ag Club memory. Can you name the year this was published in the "Ithaconian"? Please be aware that baseballs and softballs fly through the air, but must land somewhere. Please park away from the fields to ensure your vehicle is safe from damage. Due to low enrollment, Raising A Thinking Child will be cancelled for the Ithaca nights. 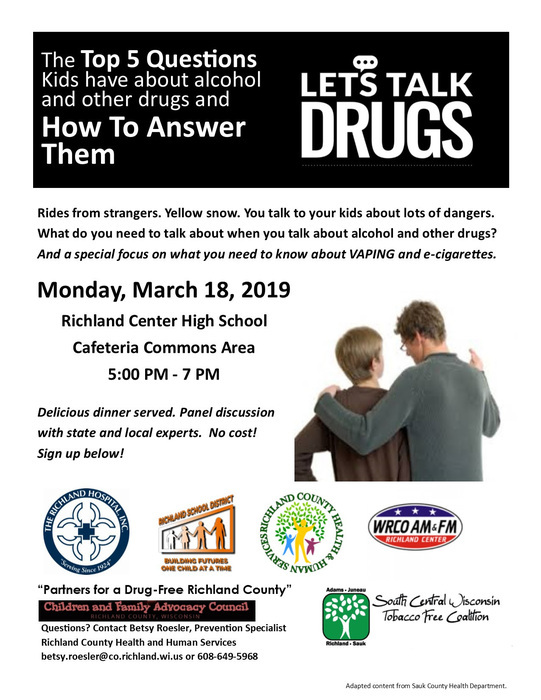 The course offered in Richland Center still has room, so interested families may register for that location. 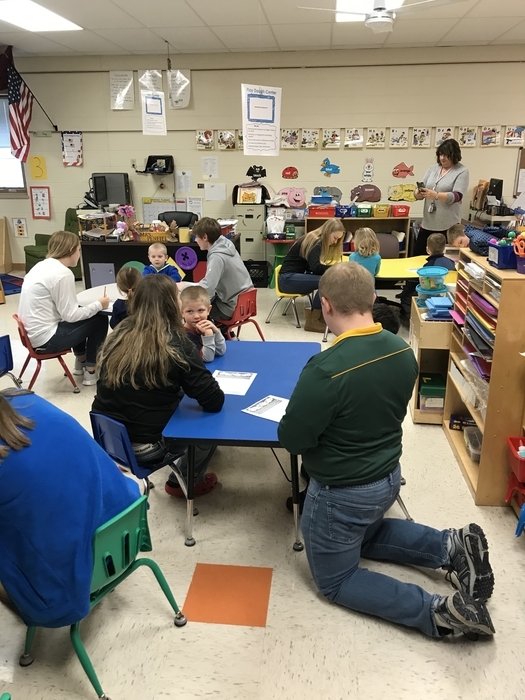 Raising A Thinking Child - Richland Center will be held Thursday evenings April 4-May 16 from 5:15-7:00 pm at Doudna Elementary School in Richland Center. 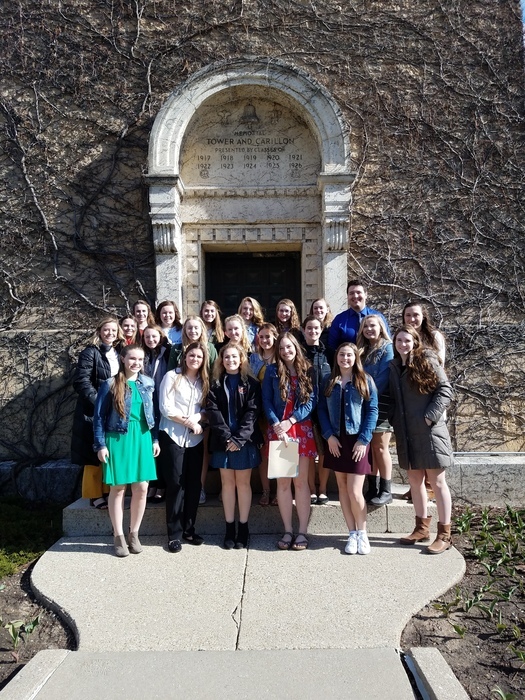 Forensics Team: Let's work for gold at State---it's Saturday, April 13! Sign-up sheets are posted; reserve your practice time! A reminder that the winter sports recognition night for our athletes and coaches will be on Thursday March 28th at 7:00 pm. It will be held in the HS Commons. A reminder to families! This Friday is a FULL DAY. This was changed to a full day to help make up time lost over the winter. This Friday marks the annual Preview Day at Southwest Tech! Preview Day features a variety of information helpful for interested students, including: Southwest Tech Informational Presentation Program and Industry Student Panels Program Fair (every program will be represented by program faculty and/or program students) Scholarship Workshop – Scholarship deadline is 3/31 Campus Tours Free Applications (from anywhere) If you are interested, please pre-register for the event at this link. https://www.swtc.edu/admissions/visit-registration.aspx?visitType=PREVIEW Great event for juniors that are interested in applying next year, or any senior that is still considering Southwest Tech. Are you interested in becoming a teacher? CESA 3 is hosting two open house events for people interested in learning more about the EXCELLENCE IN TEACHING PROGRAM. This is a DPI-approved post-baccalaureate program for those with a bachelor's degree that leads to a teacher license in 11 months. 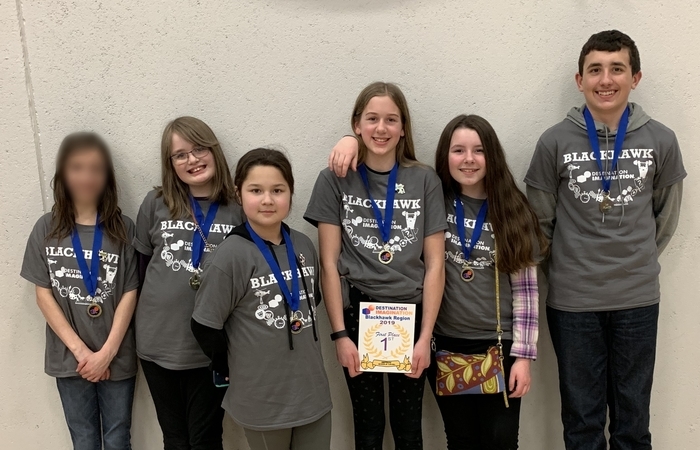 Congratulations to the 6th grade Destination Imagination Improv team consisting of Ilana Bloczynski, Sammy Clary, Maggie Gschwind, Holly King, Tristen Peterson, and Trista Pluemer for earning first place at the Blackhawk regional competition on Saturday. 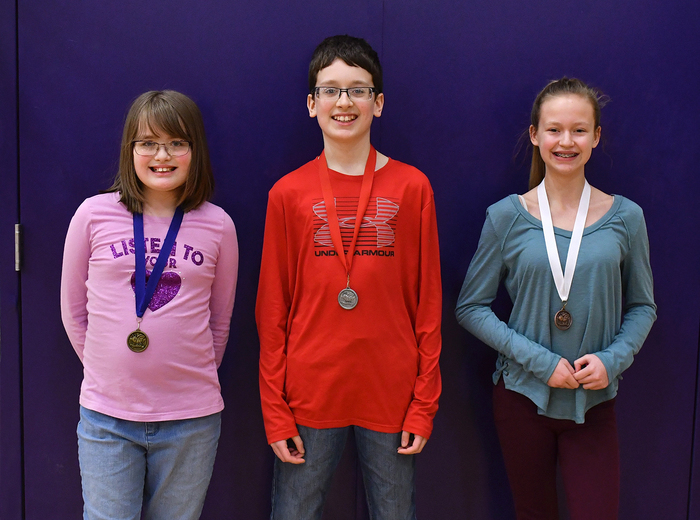 By placing in the top 2 they earned the right to compete at the State DI competition at UW Green Bay on April 13. Attention all 8th thru 11th grade students interested in volleyball next fall: Coach Crook will be here to meet with you during ATTACK to go over summer league and camp opportunities. Please meet in Mrs. Jump’s room on Thursday, March 28th. Congratulations to all youth and middle school wrestlers on a great season. Place winners at the Wisconsin Wrestling Federation State tournament were: Anna Logue 6th, Memphis Burkhalter 5th, Emma Hilby 4th, Marshall Self 4th, Kinleigh Frost 3rd, and Ryan Biermeier 1st. 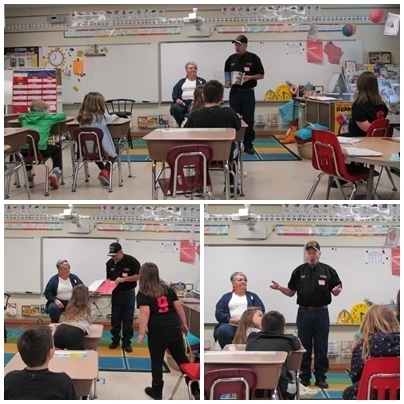 Mr. and Mrs. Larry Scott (Syvannah Scott's grandparents) visited Mrs. Steinmetz's Class to show their appreciation for the cards we made for Larry's mail call during his Badger Honor Flight to Washington, D.C. While here, they showed us photos of famous monuments in Washington, D.C, showcased the collection of cards he received, discussed his service in the war, and explained the process of the Honor Flight. During this special visit, our class learned valuable lessons about geography, history, generosity, and kindness! 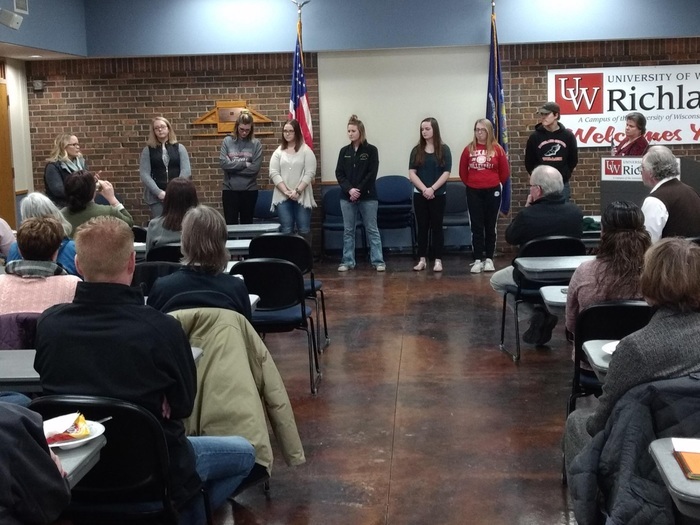 The American Legion Auxiliary essay winners have been announced. The theme was how can we address and prevent veteran homelessness in our communities. There were a total of around 80 essays submitted. Ithaca Winners include... 1st place- Aaron Bloczynski, 2nd place-Kaylee Peterson 3rd place- Alexia McCullough Congratulations to these students and their teacher! Job Well done! 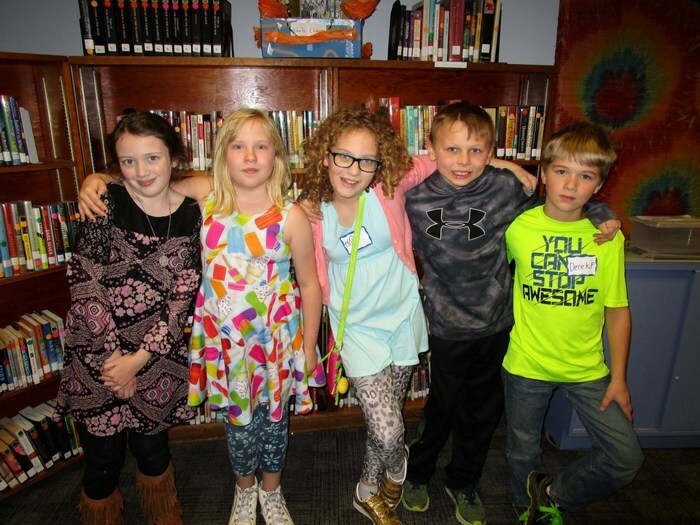 Congratulations to the 3rd graders who competed at the Belmont Invitational Lit Wars contest yesterday. Placing 3rd in his book was Gage Buscher. Placing 2nd in his book was Peyton Brown and placing first in their books were Reid Wobschall and Alyssa Olson. Congratulations on a job well done! Today’s Winner of the $50.00 Ithaca Wrestling Raffle is Jeremiah Ringelstetter, on Saturday, March 23, $200.00 is Diane Smith and on Sunday, March 24th, $300.00 is Mark Fosterling. Good luck to the following Ithaca Wrestlers at State Youth Wrestling this Friday and Saturday: Jonathan Steele, Caden Keller, Emma Hilby, Kinleigh Frost, Anna Logue, Ryan Biermeier, Marshall Self, Memphis Burkhalter, and alternates: Braxton Fowell, Zach Jacobson, Logan Anderson, and Wyatt Hilby. There will be a popcorn sale this Friday, March 22. Cost is 50 cents a bag, limit 2 bags per student please. Proceeds this week will go to the 1st grade class. Middle and High School students: we will come around to the classrooms to sell at Attack time with teacher permission. Today’s Winner of the $50.00 Ithaca Wrestling Raffle is Dan McCauley. 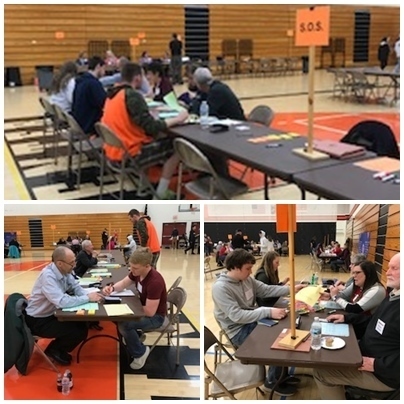 Ithaca High School personal finance students took part in the "Get Real" Program today at Richland Center High School sponsored by the UW Richland Extension office. Each student chose a career and were given their salary for a month and then had to make that salary stretch to pay for all of the necessities in life including but not limited to childcare, groceries, insurance, utilities, clothing, gasoline, housing, automobiles etc. There were many wonderful community member volunteers who helped the students "Get Real". 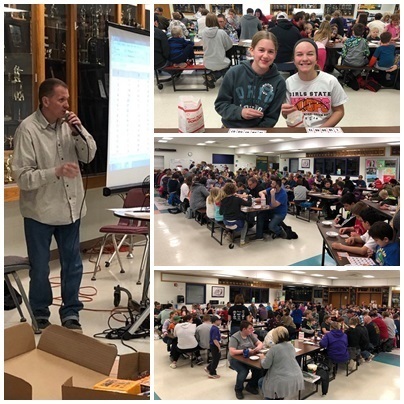 From Mr. Rice: We will have our winter sports recognition night on Thursday March 28, 2019. It will be held in the commons at 7:00 pm. Plan ahead! Our spring blood drive will be May 1st in the Community (old) Gym from 9am until 2pm. 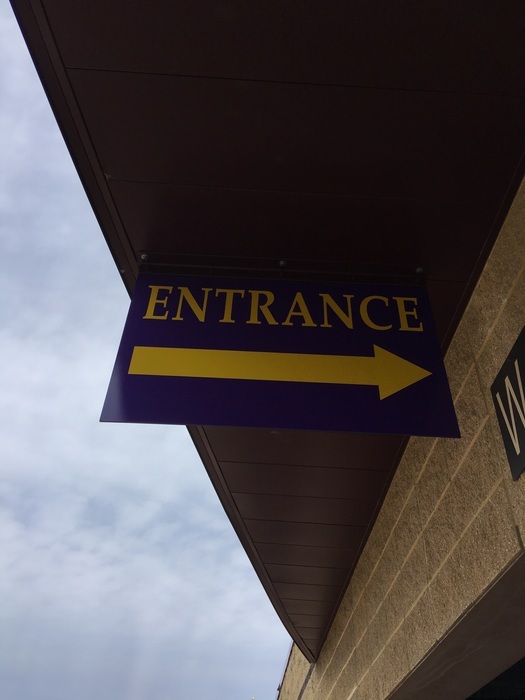 Sophomore and Junior drivers: We ask that you again park in the south lot (below the old gym) to allow for parking in the north lot for visitors, parents, substitute teachers. Thank you for your cooperation. Freshman: Please pay your class dues of $15 to Mrs Moser by March 29. Today’s Winner of the $50.00 Ithaca Wrestling Raffle is Isaiah Fargen. Congratulations to the Ithaca Youth Wrestlers who qualified for youth state wrestling last weekend: Jonathan Steele, Caden Keller, Emma Hilby, Kinleigh Frost, Anna Logue, Ryan Biermeier, Marshall Self, Memphis Burkhalter. Alternates are: Braxton Fowell, Zach Jacobson, Logan Anderson, and Wyatt Hilby. The Ithaca FCA (Fellowship of Christian Athletes) will be hosting an outreach tomorrow night: ‘Heart of an Athlete’ Where: RC City Auditorium 182 N Central Ave. Time: 6:30-8:00pm All middle school, high schools and college students are welcome & encouraged to attend. Be inspired, be encouraged! Local guest speaker, Ithaca graduate, Nolan Clary will be sharing his story about a recent missions trip he went on with his college friends. We will have powerful worship, fellowship and testimonies. Refreshments and door prizes will also be given. All are welcome. Cost is FREE! Hope to see you. Bring a friend! Attention students in grades 3-12! 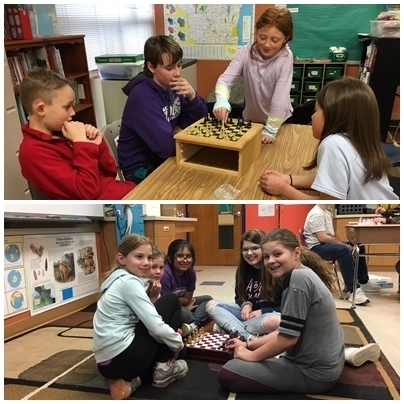 PTSO Game Club will be held on Thursday, March 21 from after school until 4:50 PM. We will meet in the commons for a healthy snack and then go to the Multi Purpose room. 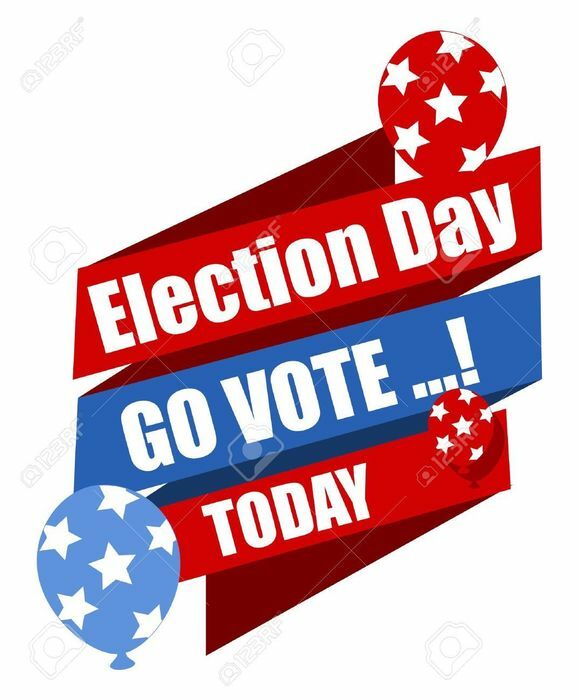 Elementary students remember to turn in your permission forms. The Cat's Pajama's Vocal Band is coming to Ithaca tonight at 7:00 PM! They are a five person a capella group that been touring around the world since 2005 and has been featured on America's Got Talent & NBC's The Sing-Off. Tickets are available in the office, in the choir room from Mr. Braatz, or at the door tonight! Partial proceeds benefit Ithaca Choir. Today’s Winner of the $50.00 Ithaca Wrestling Raffle is Margaret Rossing. Middle school students! Track season is upon us. The first day of the season is Monday, March 25th. Meet in Mr. Triphan's room at 3:35. A sign up sheet is on the window outside the office. 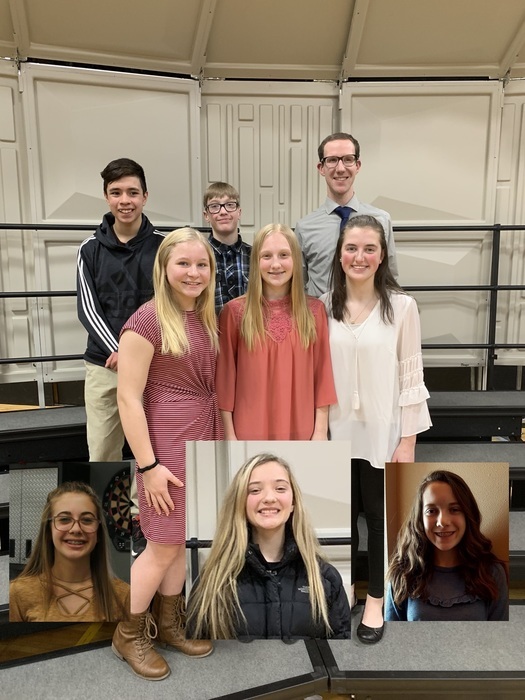 Congratulations to the Middle School Band and Choir students on their performances at solo/ensemble contest on Saturday at Boscobel HS. They received 23 firsts, 16 seconds, and 2 thirds. Nice job everyone! Ithaca High School Senior, Haley Durst signed her letter of intent to attend UW-LaCrosse next fall, committing to their Track and Field athletic program. Haley was the 2018 State Champion in Division 3 100m dash. Pictured with Haley are coaches, Jeanna Lorenz and Brady Nelson, parents Keith and Lori Durst, Haley, and sister Hannah Durst. Congratulations and Best of Luck! Reminder! 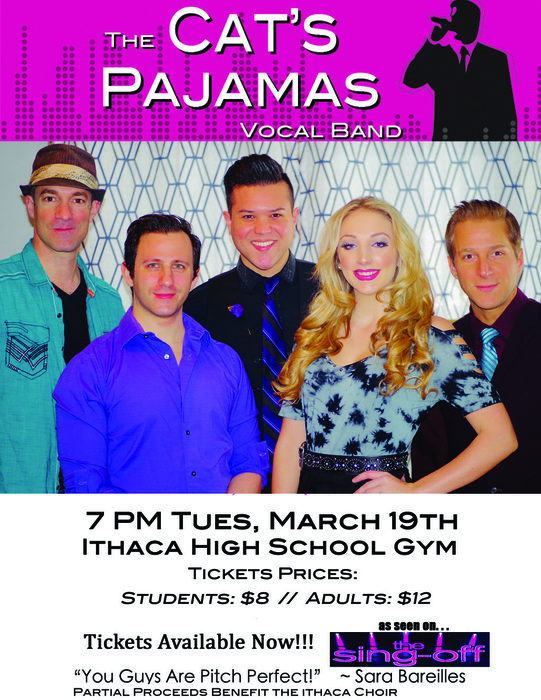 The Cat's Pajama's Vocal Band is coming to Ithaca tomorrow, Tuesday, March 19th. They are a five person a capella group that been touring around the world since 2005 and has been featured on America's Got Talent & NBC's The Sing-Off. See High School and Middle School choir students to order tickets or get direct tickets from Mr. Braatz in the choir room. Congratulations to the following students who placed in the annual Delta Kappa Gamma writing contest sponsored by our local Lambda Chapter. Students are required to write and illustrate their own work. This year Ithaca's 3-10th grade students participated and we had many, many place finishers. These students will be recognized at a reception later in March. Books earning first place are entered into a state-wide competition. Those results will be announced later this year. Great work, students and teachers! Today’s Winner of the $50.00 Ithaca Wrestling Raffle is Ashley Klingaman. Today’s Winner of the $50.00 Ithaca Wrestling Raffle is Linda Englehard, Saturday’s winner is Mark Fosterling, and Sunday’s winner is Linda Pickel. Forensics Team: Please be in the commons by 6:15 a.m. this Saturday. We will meet quickly then board the bus to the district meet. We should return around 2:30. Good luck, speakers! 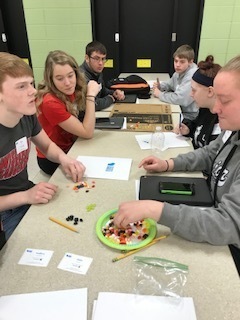 Seniors participated in "Mini" Business World program led by Michelle Grajkowski of Wisconsin Business World. 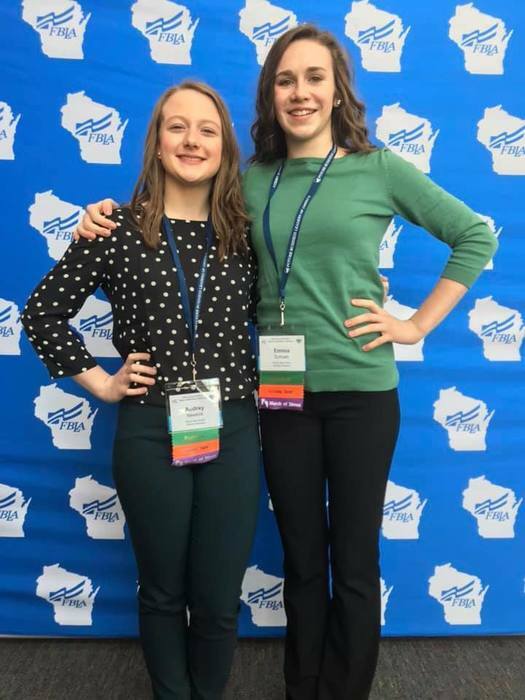 "Mini" Business World condenses the core curriculum of the summer program and brings it on-site to participating Wisconsin high schools, technical colleges, universities or manufacturers during the school year. 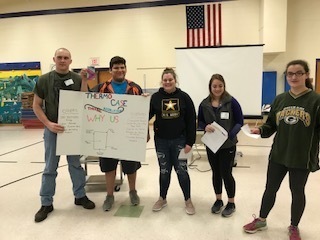 Ithaca students worked together to learn about entrepreneurship, financial literacy, business ethics, career planning, the value of the free-market economic model and the inner workings of Wisconsin's economy. oday’s Winner of the $50.00 Ithaca Wrestling Raffle is Kinleigh Frost. CESA 3 will be offering another Substitute Teacher Training on Tuesday, April 23, 2019, from 9:00 a.m. - 3:00 p.m. This training is offered for anyone with a 2-Year Associates or 4-Year Bachelors Degree and is a requirement to be considered as a substitute at Ithaca School District if you do not have a teaching license. Participants will learn the general expectations of a substitute teacher, pertinent information on health issues, successful discipline techniques, hints of working with students who have special needs and more. Please see attached flyer for more information and feel free to share with anyone who inquires about a training to become a licensed substitute teacher. Spreading kindness by sharing time and talent! Fifth graders are posting kindness flowers around the school, as well as some quotes and memes. 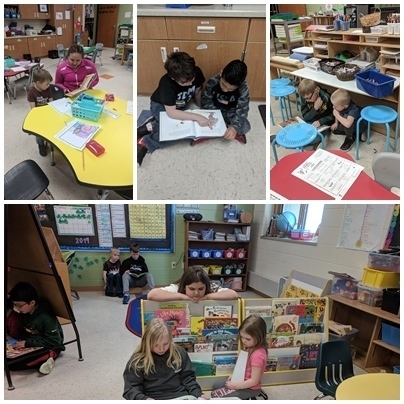 Tuesday, we partner read books about kindness and goodness. We also started hanging hearts on the kindness tree in the elementary hallway. Stop by and see! Don't forget to share your own acts of kindness and use the hashtag #ithacakindnesschallenge2019 to have the chance to win a prize. Today’s Winner of the $50.00 Ithaca Wrestling Raffle is Steve Fairbrother. The Ithaca School Board has eliminated three early releases to add time to the school year. March 29, May 31 and June 6 will all be full days of school. If there is another missed day due to inclement weather, June 7 will be added as a day of school. 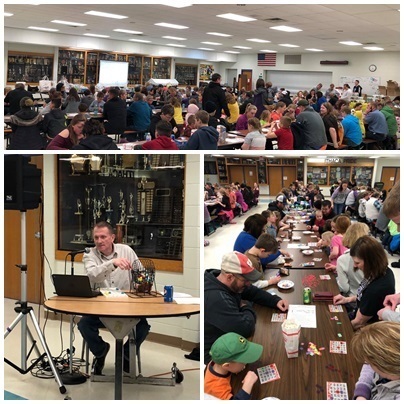 The Ithaca PTSO's 1st Annual BINGO night was a huge success! A very big thank you to sponsors, helpers, Mr. Hess, and all our families who came to participate. We hope to make this an annual event, so see you next year! On Wednesday, March 13th, we will be hosting a special night for Junior students and parents to talk about post secondary options. The evening will begin at 6:00pm in the school library. Please see Ms. Bevan for more information. Today’s Winner of the $50.00 Ithaca Wrestling Raffle is Mike Engelhard. Ithaca Kindness Week starts today! The fifth grade are leading the elementary in creating a culture of kindness and compassion throughout the school. 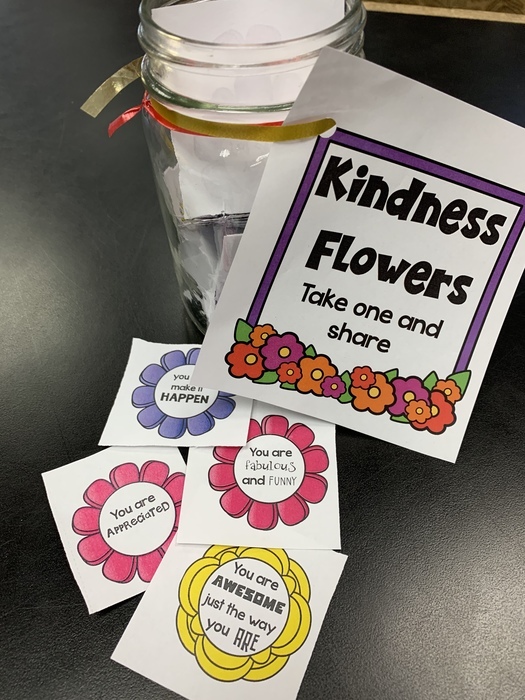 Kindness flowers encourage a positive culture of kindness by making everyone feel important and valued. Spread kindness! 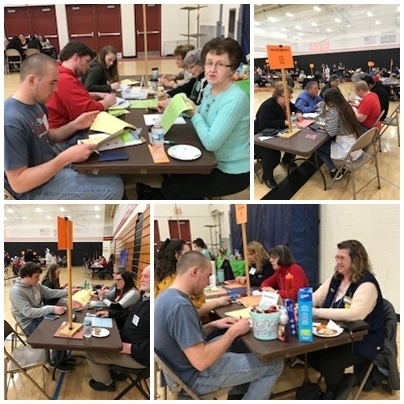 The Ithaca School District presented an Engaging Families in Literacy Program on March 5th for parents of students in 3rd grade through 8th grade. The program was held from 5:15-6:30. Mrs. Jenna Wipperfurth, one of the elementary special education teachers along with Mrs. Andrea Newkirk the Reading Specialist, welcomed parents and explained the goals for the evening. Our program began with a presentation from Ms. Kathy Stoltz, the children’s librarian at the Brewer Library. Mrs. Emily Zorea gave book talks and modeled how to use the digital library. Mrs. Shawna Kitsembel and Mrs. Denise Huffar modeled strategies to assist children with decoding words, comprehension, and fluency. 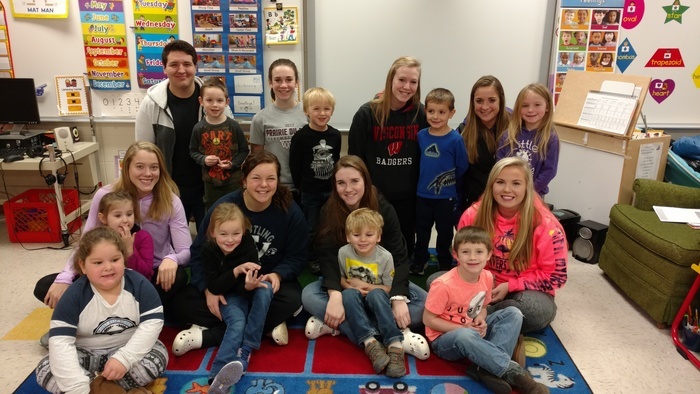 The Middle School Student Council babysat children during the parent presentation. We appreciate the deal on pizzas through Pizza Hut and the delicious bars that were donated by Kris Ortiz from Center Cafe. Thank you to Mrs. Michele Wobschall for her assistance prior to our presentation. This event would not have been possible without the support of our elementary principal, Mrs. Schoen. On Wednesday March 13th, the senior class will be hosting Share Night at Culvers in Richland Center from 4-8 pm. Please come out and support the seniors! Thank you to all who participated in our first community meeting to review/recreate our mission and vision. We reconvene to continue this process on March 12th at 6pm. As we review/rewrite, we hope you all will actively involve yourself in the process. All community members, regardless if they currently have students in school, as well as staff are asked to participate in these meetings. 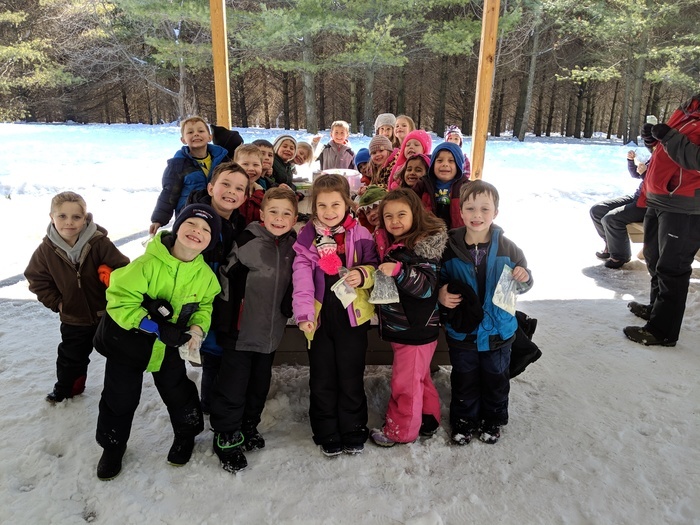 On Friday, elementary students spent time at the School Forest with the EELs and Mr. Cler. We did lots of sledding. The kids made “snow ice-cream”, and they had a scavenger hunt. Reminder: Tonight there is a School Board of Education meeting at 7pm in the LMC. All Ithaca Band Students are starting to sell this fundraiser. 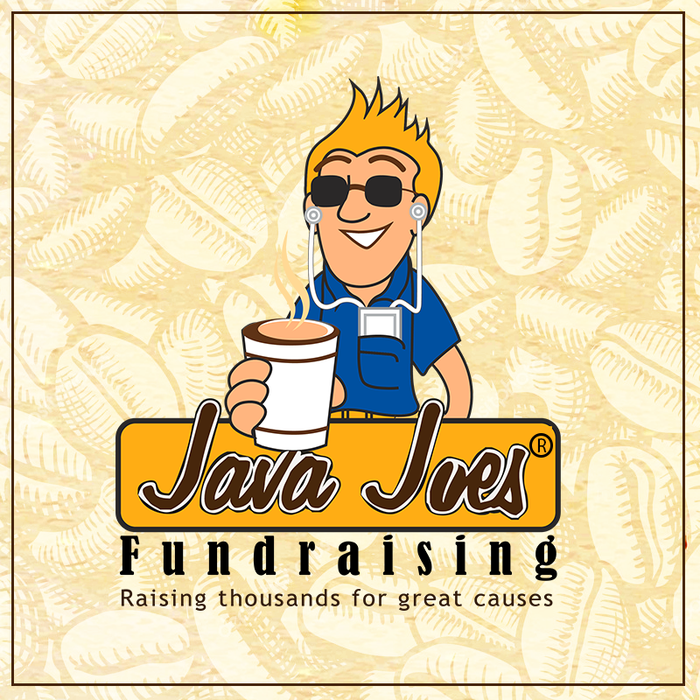 Buy some coffee or fudge and support the band trip to Florida in 2020. Today’s Winner of the $50.00 Ithaca Wrestling Raffle is David Manning. Sunday's winner was Jody Harrison. Saturday's winner was Sara Dahlke. Juniors: Just a reminder that the ACT makeup date is Tuesday, March 12th. Please bring #2 pencils, calculators, and be ready to board the bus at 8am Tuesday morning. 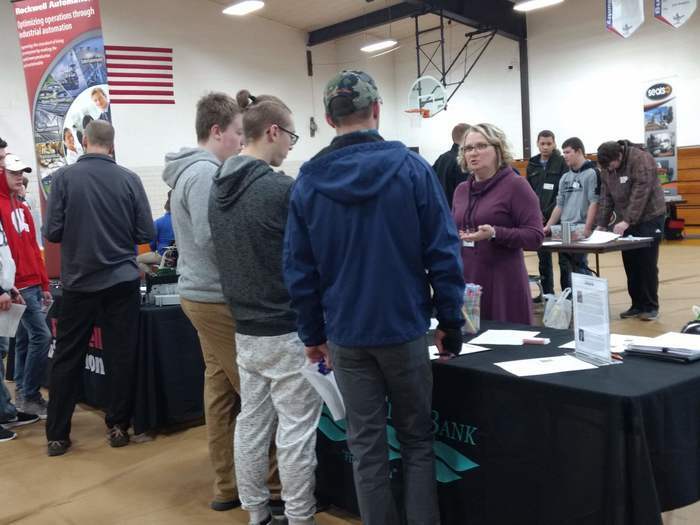 The Career Education Cooperative expo was designed for sophomore and junior students in the Ithaca, Hillsboro, Richland Center, Kickapoo, Riverdale and Eagle schools to explore the opportunity of Youth Apprenticeship available to them as well as meet local business representatives who support the Apprenticeship program. This gave the students the opportunity to ask questions and learn about some amazing businesses in our community they may not be aware of as they begin planning for their future beyond high school. Students can begin employment as early as June 1 prior to starting their junior year and can also earn up to six paid college credits each year. Co-directors of the program are Pam Kaufman and Monica Kershner. Betsy Wiedenfeld was diagnosed with colon cancer on January 15, 2019. She is currently awaiting surgery and treatment. In the meantime, she has been unable to work, and needs the support she offers to so many others in their own times of need. Betsy has cared for many young Bulldogs in her in-home daycare, which she has had to close since her diagnosis. 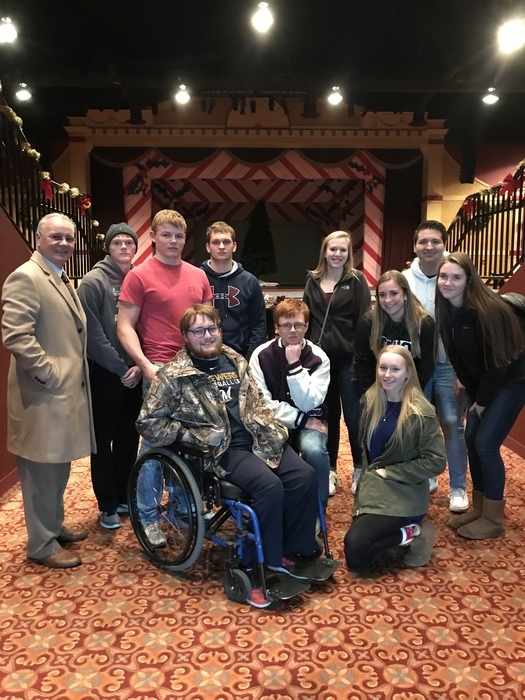 The Ithaca Lions are partnering with Thrivent Financial, RC Class of 1983, and many local groups to host a pancake breakfast to assist Betsy and her family during this stressful and challenging time. Any silent auction or bake sale questions may be directed to Heather Dickey. Others looking to donate time or talents may contact the Ithaca Lions. 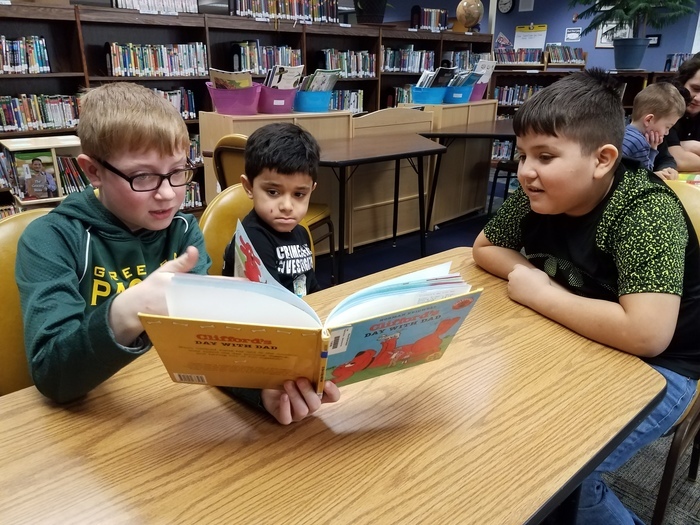 All elementary students read the Golden Archer Book Award nominees and voted for the book they felt should win the award. The Golden Archer book award is given by the WEMPTA (Wisconsin Educational Media and Technology) organization. 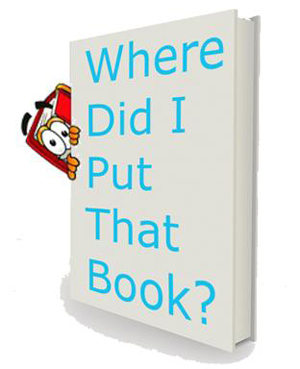 It is one of the few children's book awards in the nation that is chosen entirely by students. 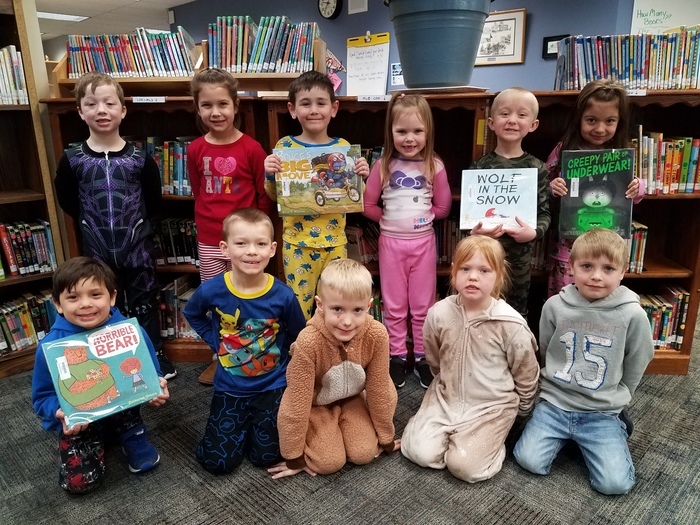 The book nominees included: Horrible Bear by Ame Dyckman Bruce's Big Move by Ryan Higgins Wolf in the Snow by Matthew Cordell Creepy Pair of Underwear by Aaron Reynolds "Creepy Pair of Underwear" was our school's hands-down winner. "Wolf in the Snow" came in second, and was followed in votes by "Bruce's Big Move". Today’s Winner of the $50.00 Ithaca Wrestling Raffle is Remmington Fowell. Ithaca Kindness Week starts Monday, March 11-15. The fifth grade will lead the elementary in creating a culture of kindness and compassion throughout the school. Each day will be dedicated to doing kind acts and spreading awareness about the importance of being kind to each other. We are happy to invite YOU to participate using the Family Edition checklist. This checklist will come home on Monday and you and your student can work together to complete the checklist anytime, anywhere. Please share your Random Acts of Kindness with us through social media using the #ithacakindnesschallenge2019 at the end of the week we will randomly choose a family who participated for a prize. Not only is this a great way to spread joy and kindness but also a way to show our students how social media can be used in a positive way. Remember to have fun and be creative! Reminder: Friday, March 8, from 6-7:30 is our FREE Ithaca Family and Friends Bingo night in the Ithaca School Commons! We have TONS of awesome prizes donated by area businesses like Lime Ridge Ag, Community First Bank, Jones Chevrolet, Fillback Ford, Greeley Signs, Olson Trucking, Simpson's Tractor, AutoZone, The Robin's Nest, Prem Meats, Richards Insurance, and Main Street Books Reedsburg along with gift certificates to Oakwood, The Richland Locker, Prem Meats, Arthur's, Pizza Hut, Center Cafe, GAP Fit-N-Fun, The Robin's Nest, Chet's Feed & Seed, Bindl Tire, Kelly's Coffee, The Ithaca Library Book Fair, and Galaxie Skate Center. The PTSO threw in some fun games, toys, gift baskets, and lots of Ithaca spiritwear too! Can't wait to see you there! This week is School Social Work week. School Social Workers support the school community and fellow school professionals by contributing to a team approach. Mrs. Pluemer is especially thankful for the wonderful, supportive staff, parents, students, and others with whom she has the privilege to serve the Ithaca community. The Ithaca students and staff are thankful for all she does for us as well! In social studies, fourth grade students created dioramas representing the early Native American groups and their Wisconsin environments. Students studied about the homes, environment, food, and cultural traditions of these people. These early groups inhabited Wisconsin from 10,000 B.C. to 1200 A.D. The Paleo, Archaic, Woodland, Mississippian, Oneota groups are represented in the dioramas that are currently displayed in the library. There will be a popcorn sale this Friday, March 8. Cost is 50 cents a bag, limit 2 bags per student please. Proceeds this week will go to the 2nd grade class. Popcorn will be sold to middle and high school students at Attack time with teacher permission. Today’s Winner of the $50.00 Ithaca Wrestling Raffle is Jeremiah Ringelstetter. Plan ahead families! The Ithaca High School Scholarship Awards Program will be held on Friday, May 17th at 10am. There will be a luncheon to follow for seniors, their parents, and scholarship donor guests. This week is School Social Work Week! School Social Workers: •	Enhance professional capacity of school personnel •	Facilitate engagement between student, family, school, and community •	Promote a school climate and culture conducive to student learning and teaching excellence •	Actively participate in team collaboration and problem-solving Remember your School Social Worker this week! This week is School Social Workers Week! School Social Workers: • Are trained mental health professionals • Have a degree in Social Work • Provide services related to a person’s social, emotional, and life adjustment to school and society • Are the link between home, school, and community in providing services to students, families, and school personnel • Promote and support students’ academic and social success Our school social worker, Mrs. Pluemer works to incorporate this and so much more into our district. Thursday, March 7 is the singlet and wrestling gear return for all kids that will not be wrestling at any more tournaments this year. You can drop these off between 5:30 and 7 in the school commons - give them to Marty Fargen. High School Baseball: There will be a team meeting in Coach Kelly's room on Friday March 8th immediately after school. Be There!! Today’s Winner of the $50.00 Ithaca Wrestling Raffle is Jesse Hash. FCA (Fellowship of Christian Athletes) Huddle will be tomorrow morning, Thursday March 7th, 7am FACE room. Start your day and join us for a Big Breakfast, fellowship and an inspiring devotion & message! All middle school and High School students are welcome! Bring a friend! Richland Junior Bowlers All you can eat Pizza Buffet on Thursday, March 14th, 4:30 PM - 7:30 PM at the Phoenix Center Bowling Alley in Richland Center. Cost is $10 per person & $5 for ages 10 & under. All You Can Eat Pizza also Includes: Tossed Salad, Dessert, Soda, Coffee & Water. Silent auction items, raffle prizes & 50/50 will be available! All proceeds will benefit Richland Junior Bowlers Schloraship Program. Choir Students: If you sold Butter Braids, make plans to pick them up after school this Thursday at the end of the school day. Since they are frozen you need to either deliver them right away or put them in your own freezer until you can get them delivered. Do not plan to leave them at the school because the choir doesn't have freezers to store them. Notice to elementary parents: School Forest Friday is this Friday, March 8. Students are invited to bring their sleds for this event. Sleds cannot be transported on buses because there is not enough room. 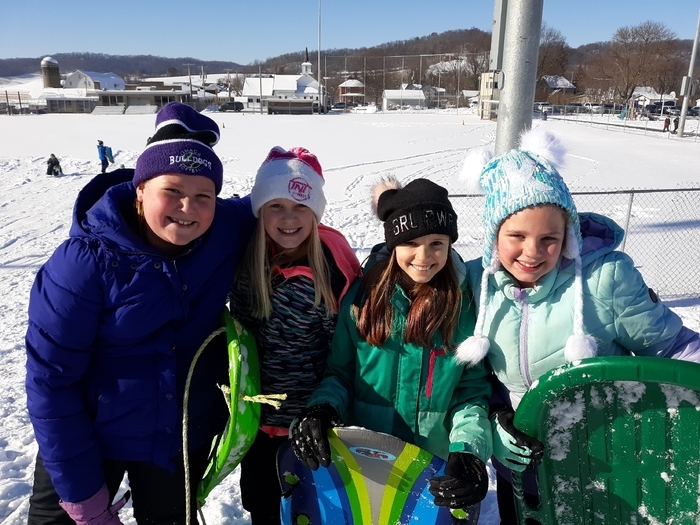 Sleds can be brought any time between now and Friday. 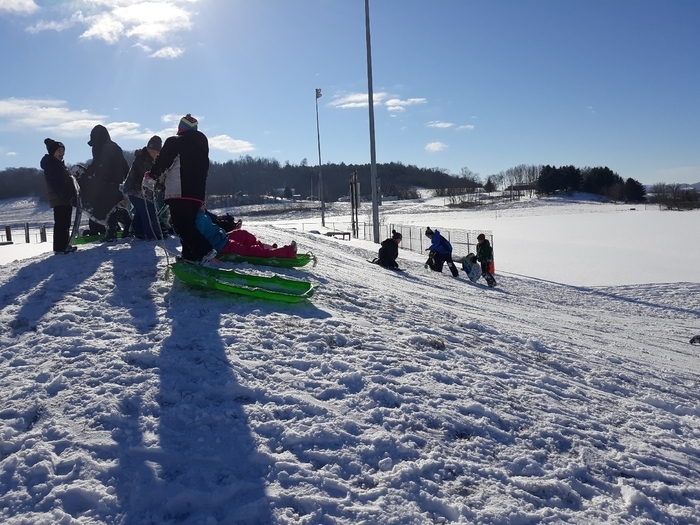 Please plan to pick up sleds Friday at the end of the day. Also, make sure your child has proper clothing for the trip. If you are in need of something, let your child's teacher know before Friday so arrangements can be made if possible. Forensics Team: The district meet is Saturday, March 16! Want to earn a trip to state? Work on your own and sign up to practice with coaches! 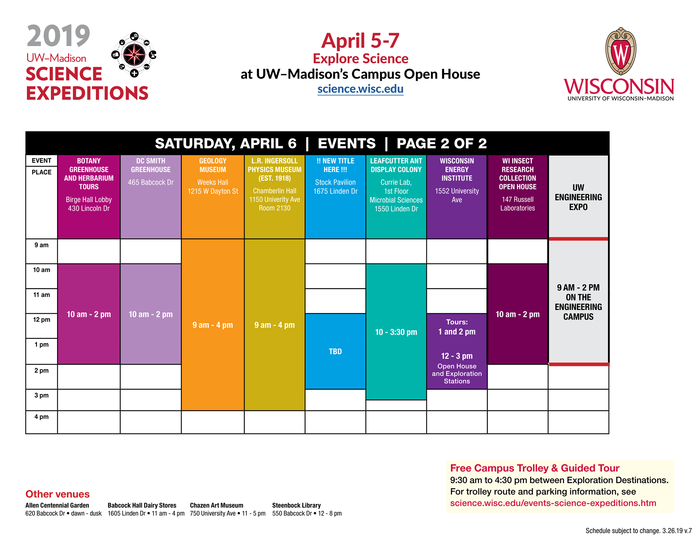 Times will be available this Saturday, March 9. Congratulations to the 4th and 5th grade Lit Wars teams! In 4th grade, Kaylee placed 3rd on her book and both Isaiah and Aubri placed 2nd on their books. The 4th grade team placed 2nd as well. In 5th grade, Ally, Izzie, and Abby all placed first on their books and placed 1st as a team as well. Special mention: the 5th graders scored 88 out of 90 questions correct for the day. Great job everybody! Elementary families! Celebrate with us next week with Dr. Seuss Dress Up Days. See flyer for details. Reminder: No school for students on Friday, March 1 and Monday, March 4. 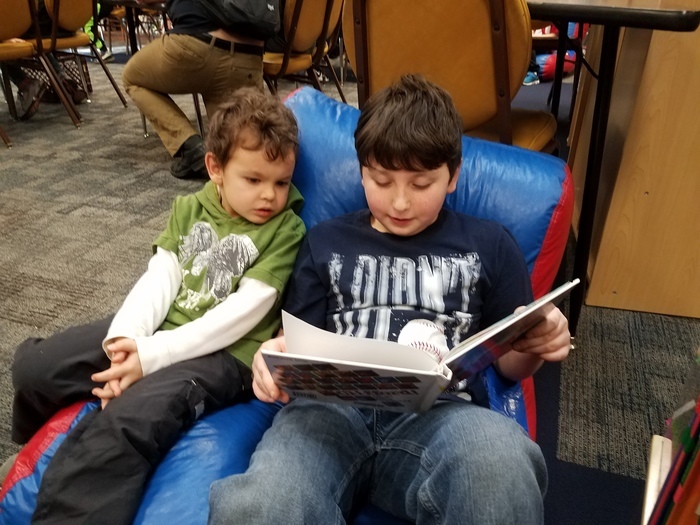 Junior Night for students and parents will be held on Wednesday, March 13th in the Ithaca High School Library beginning at 6:00pm and concluding at 7:00pm. This is an evening to discuss post-secondary options. Maggie Landsinger, Admission Advisor from UW Platteville and Matt Schneider, Student Success Coach from Southwest Technical College will be our guest speakers for the evening. Next week is National School Social Workers' Week. Our School Social Worker, Mrs. Pluemer, works to enhance the learning and success of students by focusing on the whole child. School Social Workers promote the social and emotional development of students, empower students, and value student self-determination. Remember your School Social Worker next week! Ithaca PTSO's FREE BINGO night is Friday, March 8 from 6-7:30pm in the School Commons for all families and friends. Bring your own snacks or buy popcorn and beverages night of. (Rural Route 1 popcorn - $5/tub) Everyone goes home with a book! La noche de BINGO GRATIS de Ithaca PTSO es el viernes 8 de marzo de 6 a 7:30 pm en la escuela Commons para todas las familias y amigos. Traiga sus propios bocadillos o compre palomitas y bebidas la noche de. (Rural Route 1 palomitas de maíz - $ 5 por tina) ¡Todos se van a casa con un libro! 4K families! A reminder that tomorrow, Thursday, February 28th there is NO 4K Class. Thank you! 10th and 11th grade students: Please turn in your permission slips for the Career Expo. to Ms. Bevan by Thursday, February 28th. Thank you! Just a reminder: Any students planning to take a college course in the fall through the Early College Credit or Start College Now Program should turn in an application to Ms. Bevan by March 1st. Art club meeting this Wednesday after school until 5 pm. All are welcome to come! Seniors: Jostens will be here next Wed., Mar. 7th to deliver your caps and gowns. You will NOT receive any cap or gown if you have not paid your outstanding bills with them. Bring a check if you owe money. We will also be hosting share night at Culvers in RC March 13th from 4-8 pm. Help spread the word! ​Today is Monday, February 25, 2019. Ithaca has a 2 hour delay. Families and students, could you please check under your bed, in your closet or backpack, maybe on your bookshelves for any misplaced library books? If you return them this week, we will waive any late fees. We'd really just like the books back to share with other readers! If you're still working on finishing the book, speak with Mrs. Zorea or Mrs. Thompson on a return plan. Swing in during parent/teacher conferences to check out the Book Fair - open during conferences times. Keep reading - never stop reading! 4th grade girls basketball practice will be canceled Saturday, February 23rd. Have a safe weekend. The 5/6 grade girls basketball tourney @ Riverdale for Saturday has been cancelled due to the weather. 3rd grade girls basketball practice is also cancelled for tomorrow morning. Thanks! Due to predicted weather, Little dribblers is cancelled for Saturday (tomorrow). The pizza party will be held on Sunday, March 2 from 12-2 in the new gym. FFA Week is coming up! Next week, Feb 25th thru the 28th, the Ithaca FFA Chapter will be celebrating FFA Week with dress up days and lunch-time activities. Monday will be: Favorite Sports Team Apparel (No hats! ); Tuesday will be Flannel Day; Wednesday will be: Favorite tractor/car/truck apparel (No hats!) Thursday will be FFA colors which are Blue and Gold. Lunchtime activities will be posted in the hallways, with ice cream being served on Thursday for those students participating in the dress up days. Five Ithaca students participated in a regional You Be the Chemist competition on Tuesday. 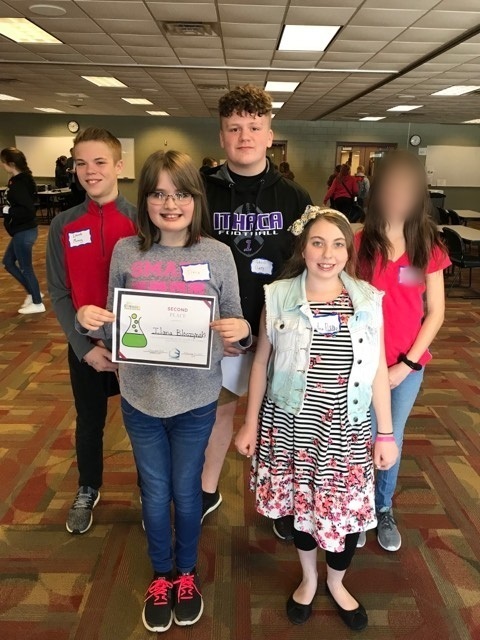 They survived some "explosive" chemistry questions and all five qualified for the Wisconsin State You Be the Chemist Competition on April 13th. Congratulations to Lincoln Manning, Anna Dahlke, John Clary, Kyla Pluemer, and especially Ilana Bloczynski who finished in second place. Good luck at state! 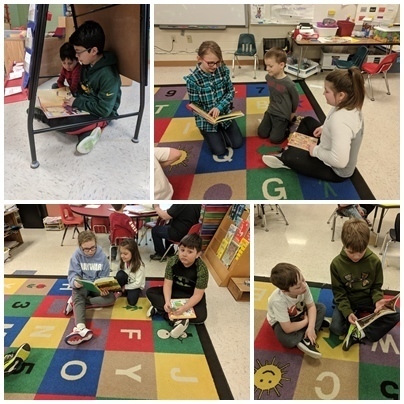 On February 8, fourteen 4th and 5th graders tested to try out for the CESA 3 Lit Wars and the first ever Ithaca Battle of the Books teams. 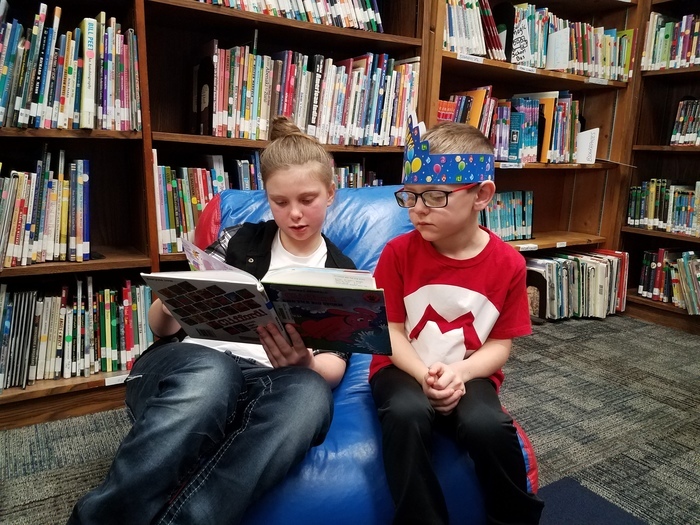 Students who tried out for Lit Wars had to read 6 preassigned books and those that tried out for Battle of the Books had to read 20 books from a designated list. Some students were motivated to try out for both teams! Great job to everyone who tried out! Attention students in grades 3-12: There will be a Game Club today after school until 4:50. We will meet in the commons for a snack and then go to the Multi-Purpose room. Hope to see you there! There will be a popcorn sale this Friday, February 22. Cost is 50 cents a bag, limit 2 bags per student please. 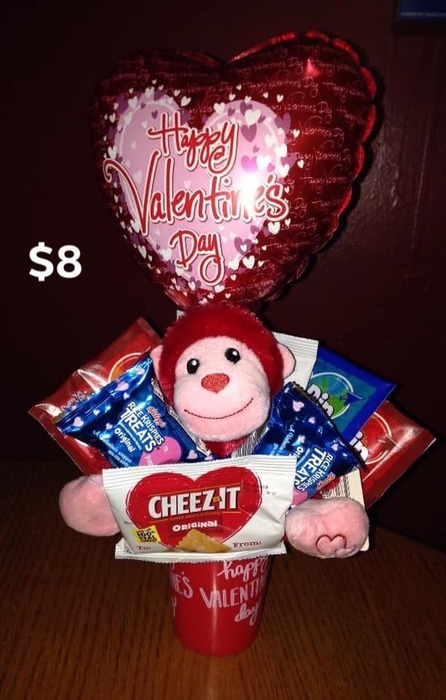 Proceeds this week will go to the 5th grade class. Starting Monday, February 25, 2019, middle school and high school students will be expected to be in class at 7:55 and will be released at 3:25. Elementary students can be picked up in the commons at 3:20. PTSO Game Club is tomorrow, Thursday, February 21 from 3-4:50 PM. Elementary students - you can still bring your permission forms and hand in to your teachers tomorrow. Parents: make sure you provide a note/dojo message so your child's teacher and the bus drivers know they are not riding the bus home. ​Today is Wednesday, February 20, 2019. Ithaca School District is closed. 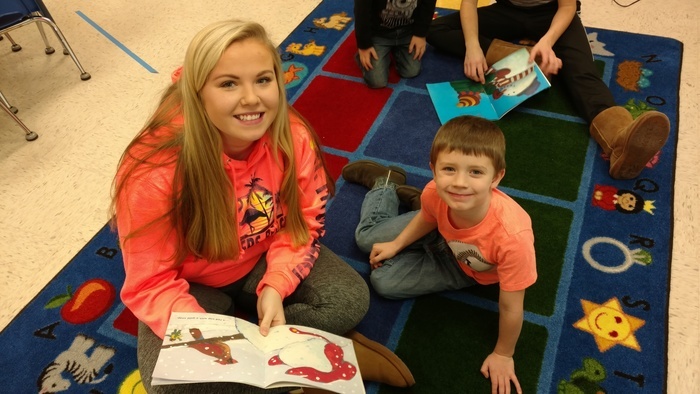 Due to a happily full schedule, 5th graders served as "Reading Buddies" to 4K bulldogs during library class today! This Thursday at 1:00 in the High School gym we will have a pep assembly recognizing all the winter sports programs, Forensics, and FBLA students. This is open to any community member! Help us celebrate our successes. Attention students in grades 3-12: There will be a Game Club night on Thursday, February 21 from after school until 4:50. We will meet in the commons for a snack and then go to the Multi-Purpose room. Hope to see you there! Also, the February PTSO meeting will be held this Wednesday, February 20, at 3:30 p.m. in the LMC. Coach Jim Harris will be inducted into the Wisconsin Football Coaches Hall of Fame on Saturday March 30th. Tickets to the Hall of Fame Banquet are available in the high school office. We will have these tickets available until February 26th. Congratulations to our forensics team on their excellent performances at the sub-district meet. These students qualified to advance to the district meet at UW Platteville in March: Demonstration: Mallory Kershner Farrago: Olivia Duell, Diego Ortiz Group Interpretive Reading: Raelyn Lasse, Ellie Crook, Anna Durst, Cortney Crook Maddie Roh, Bethany Weldon, Erin Louis, Erin Miller Montanna Scott, Keyara Perkins, Kyannah Koch Informative Speech: Carissa Willis, Brooklyn Granger Moments in History Speech: Taygan Ryan, Therese Honer Poetry Reading: Megan Burnley, Delaney Brown Prose Reading: Hannah Durst, Ryan Lee, Emma Schoen Public Address Speech: Audrey Newkirk Solo Acting: Megan Brisbois Special Occasion Speech: Julia Schoen GOOD JOB, SPEAKERS! Parents, are your students missing any winter gear or clothing? Maybe one shoe got away? We have quite the stockpile of lost and found. At the conclusion of parent-teacher conferences, whatever items still left will be donated. Please take the time to look through the collection. 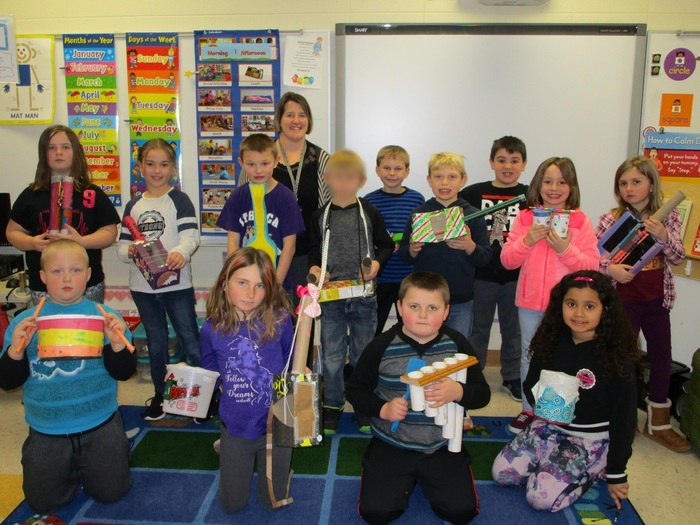 Mrs. Steinmetz's class recently created handcrafted musical instruments and then showed them off in their own marching band. Creative and fun learning! Cat's Pajamas, the choir showcase that was originally scheduled for tomorrow night in the High School gym, has been postponed. A future date has not yet been set. Stay tuned! Congratulations to both the Class of 2019 Valedictorian, Julia Schoen and the Class of 2019 Salutatorian, Diego Ortiz! Our forensics team competes tonight in Boscobel at the Sub-district competition. This sub-district and district is one of the most distinguished in the state! Good luck! As you received in the mail, you know that we are reviewing/recreating our mission and vision. The mission is what we stand for and why we exist. Our current mission was created by former board, admin, faculty, staff, parents, and community. As we review/rewrite, we hope you all will actively involve yourself in the process. On Tuesday, February 19th at 6pm, a special school board meeting will begin to address this. All community members, regardless if they currently have students in school, as well as staff are asked to participate in these meetings. Reminder: “Written Off” will be shown on Lone Rock on February 17th and in Richland Center on February 25th. In 2016, more lives were lost to drug addiction than were lost in the Vietnam War. This film chronicles the life of Matthew Edwards, whose addiction to opioids began at age 15, after being prescribed pain medicine for a minor surgery. His grippingly honest writing reveals the secrets he tried so hard to conceal throughout a decade long struggle to escape addiction. Details for the viewings may be found on our website or on our app under News. 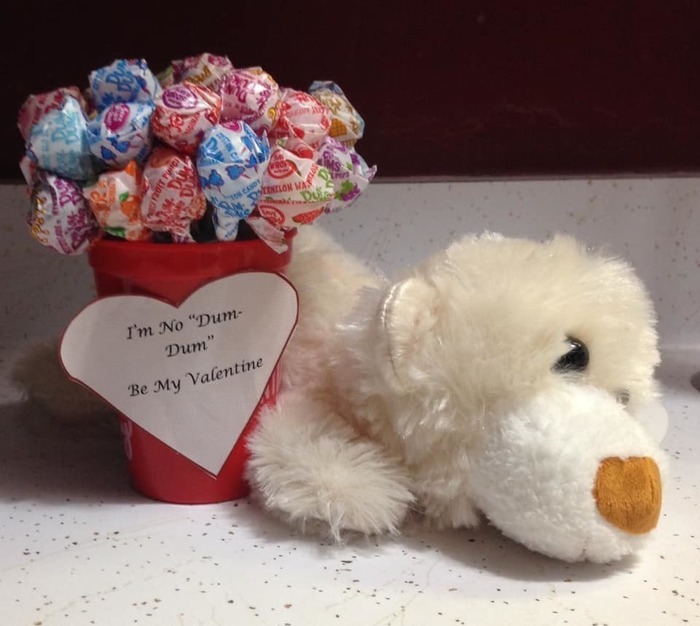 Lot's of Valentine's Day celebrations went on at school yesterday. Here is Mrs. Steinmetz's class with their boxes. Good Luck to Will Burnley, Trevor Templen, Logan Clary, Monty Jennings, Colton Clary, Sawyer Willis, Riley Astle, Cade Nettesheim, and Leo Garcia at the WIAA Sectional Tournament in Mineral Point this Saturday starting at 10:30. Attention students in grades 3-12: There will be a Game Club night on Thursday, February 21 from after school until 4:50. We will meet in the commons for a snack and then go to the Multi-Purpose room. Hope to see you there! The February PTSO meeting will be held next Wednesday, February 20, at 3:30 p.m. in the LMC. We hope to see you there. Popcorn Friday has been moved to NEXT Friday, February 22. Sorry the the inconvenience! 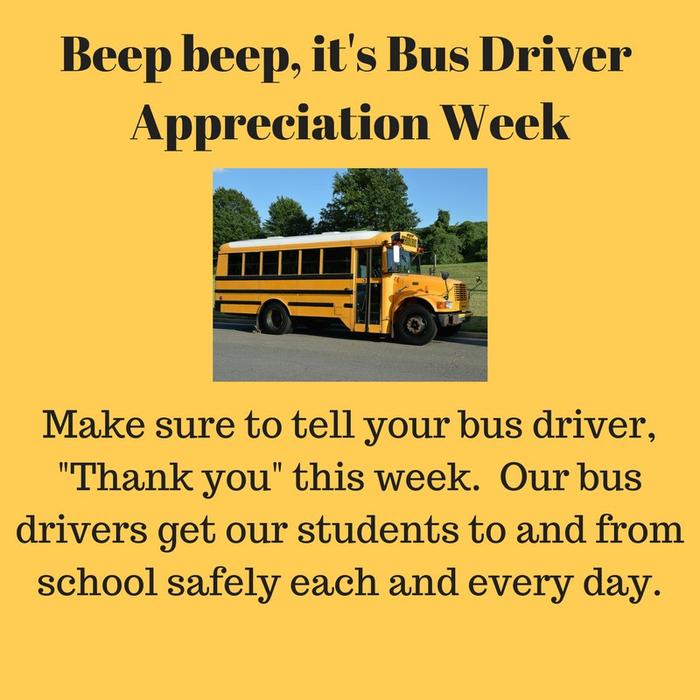 Our students are appreciating their bus drivers this week and writing letters. Ms. 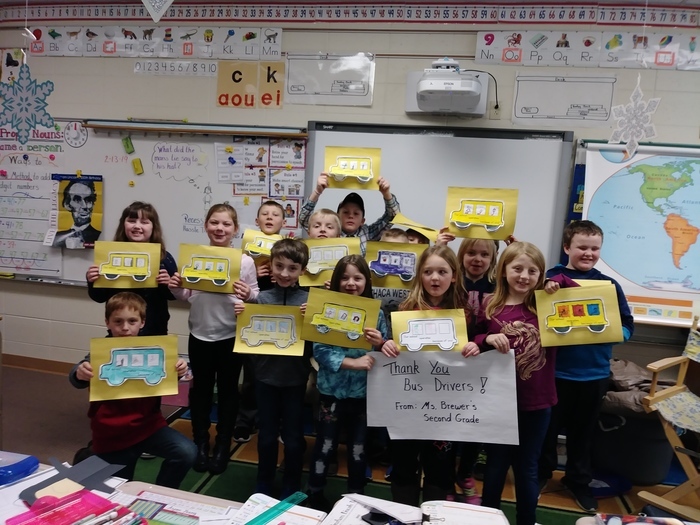 Brewer's second graders made some awesome thank you cards for our more than awesome bus drivers. Thank you drivers! Sweetheart Steak Supper tonight from 5:00-7:30 pm at the Wallace Student Center at UW Richland Campus. Goben steaks made to order! There will be Math ACT review after school today, Friday, Monday and Tuesday from 3:15-3:45. Today's Throwback Thursday brings a birthday celebration instead of trivia today. Jerry Durst turns 100 years young today. Congratulations to a member of the Ithaca Class of '36. Reminder! It's time for the second boxtops and milkcaps collection! FYI: the milkcaps program is ending in March. Elementary students bring in your items by February 15 so they can be sorted and counted. Remember: the class that collects the most gets a treat at the end of the year! 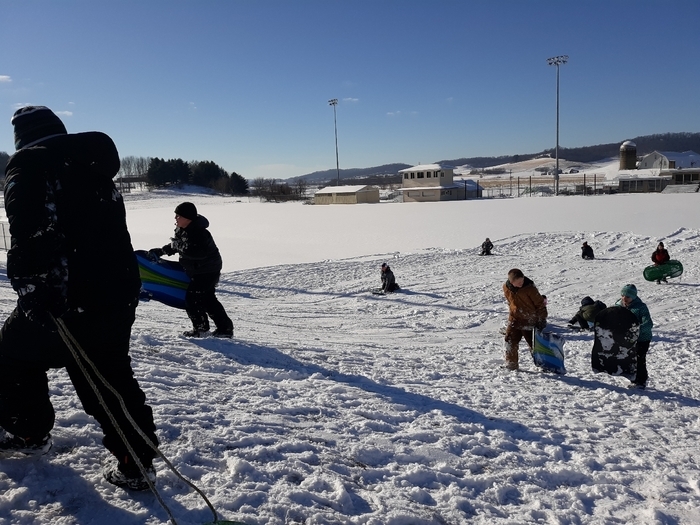 Students enjoyed the snow piles and sledding hill today! Choir students are selling butterbraids through next Tuesday the 19th. Students make sure to turn in money along with your order to Mr. Braatz or Mrs. Willis. Middle School Student Council will be participating in National Wisconsin Day on Friday, Feb. 15 by wearing Wisconsin clothing and colors. All are welcome to participate; just wear your Wisconsin gear. Starting Wed. (today) there will also be a Wisconsin Trivia for anyone that would like to participate. The trivia form will be located outside room 204. There will be Middle School wrestling practice today after school. Congratulations to our Honor Roll students! Second quarter Honor Roll is out for Middle and High School students. 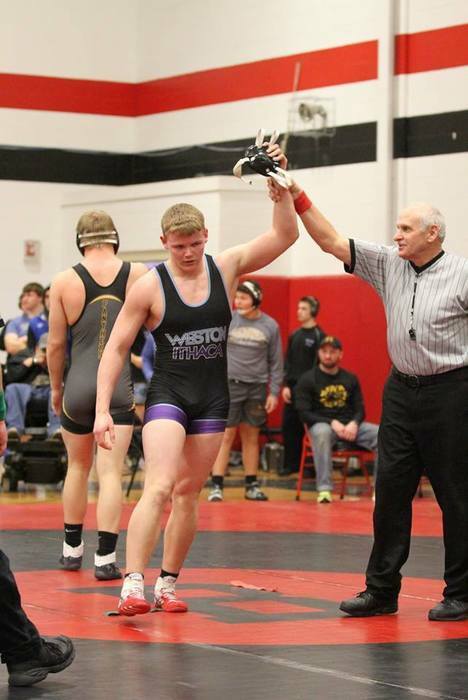 Last Saturday saw impressive wrestling action at the Regional tournament as Ithaca-Weston wrestlers advanced 9 of 11 wrestlers to the Sectional tournament coming up Saturday in Mineral Point. 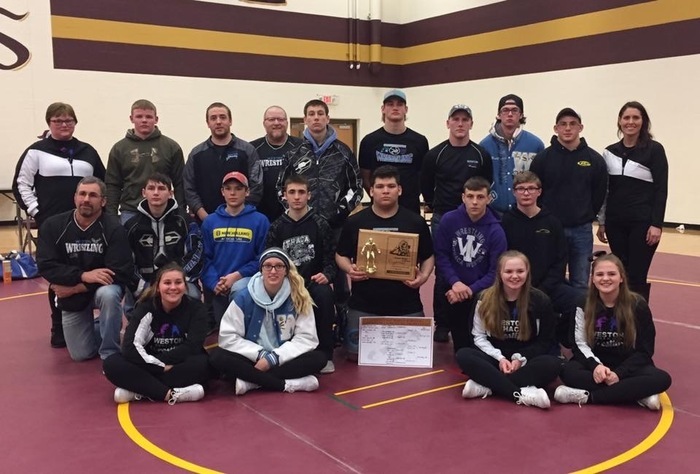 As a team, they placed 2nd behind Riverdale who was able to fill all 14 weight classes. Caps for Causes is tomorrow!! For a $5 donation students and staff may wear a school appropriate hat. Money raised goes to help local families and organizations in need. Reminder!! Tomorrow is a early release for students. Staff will have PLC. ​Today is Tuesday, February 12, 2019. Ithaca School District is closed. From Mr. Triphan: Due to the snow days, etc. juniors will be doing "Group 3" rotation on Friday (15th) and "Group 1" rotation on Monday (18th). Additionally, I will be having an extra Math ACT prep time on Thursday (14th), Friday (15th), Monday (18th), and Tuesday (19th) after school from 3:15 - 3:45 - weather permitting. 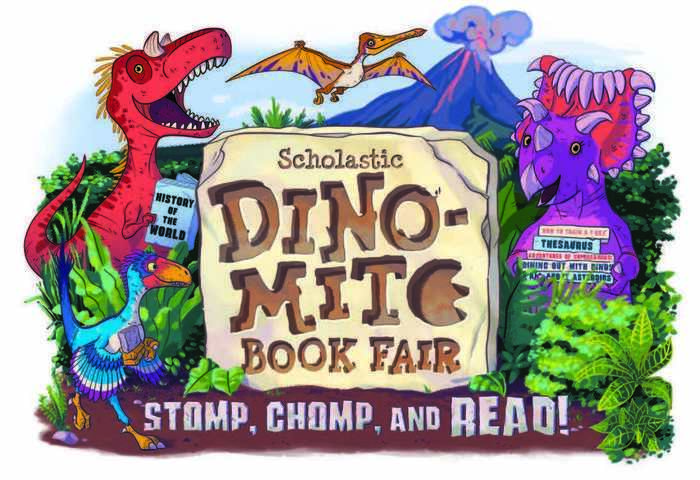 Our Scholastic book fair is open during Parent Teacher Conferences February 26th and February 28th. 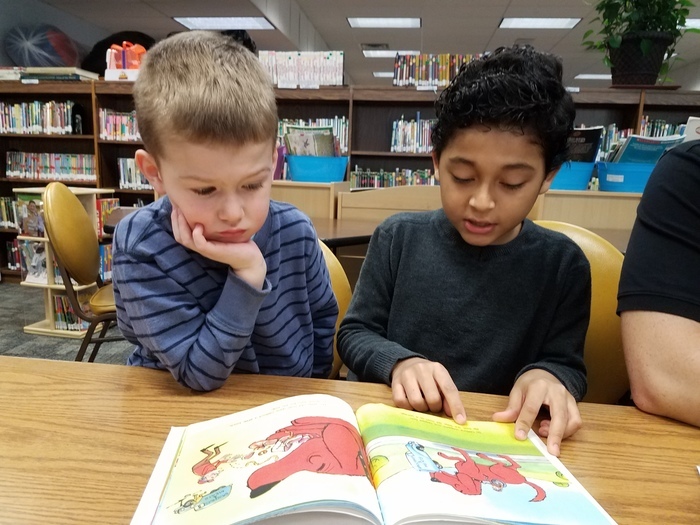 The book fair will be open during the week of Parent Teacher Conferences for your child to shop with their class, as well open to the public both days of Parent Teacher Conferences from 3:30 p.m- 7:00 p.m. The book fair will be held in the LMC. We hope to see you there! The Ithaca GIRLS basketball game at Ithaca vs. Wonewoc-Center will start an hour earlier than scheduled. JV starts at 5 PM and the varsity will follow (at approximately 6 to 6:15 PM). Please stay tuned to WRCO Radio, Facebook, Twitter and our app feed as this schedule is subject to change depending on weather conditions. So both boys (on the road) and girls (at home) game times have changed for this evening! The Ithaca boys basketball game at Wonewoc-Center will start an hour earlier than scheduled. The buses will leave Ithaca at 3:30 PM, JV starts at 5 PM and the varsity will follow (at approximately 6 to 6:15 PM). Please stay tuned to WRCO Radio, Facebook, Twitter and our app feed as this schedule is subject to change depending on weather conditions. 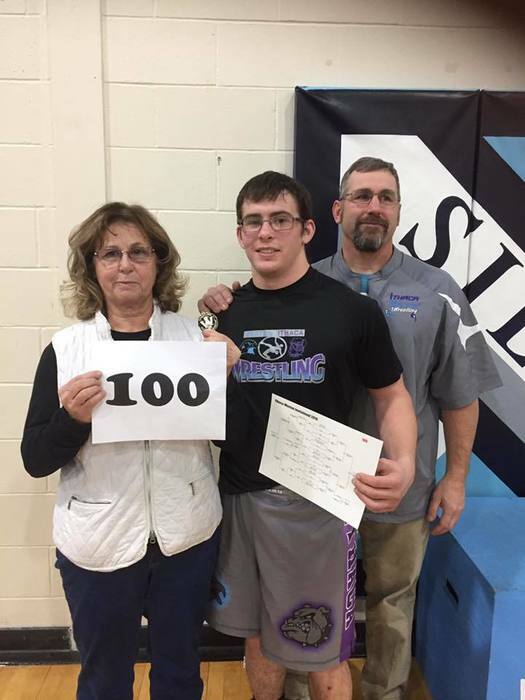 Congratulations to Senior Cade Nettesheim who reached an impressive milestone on Saturday! 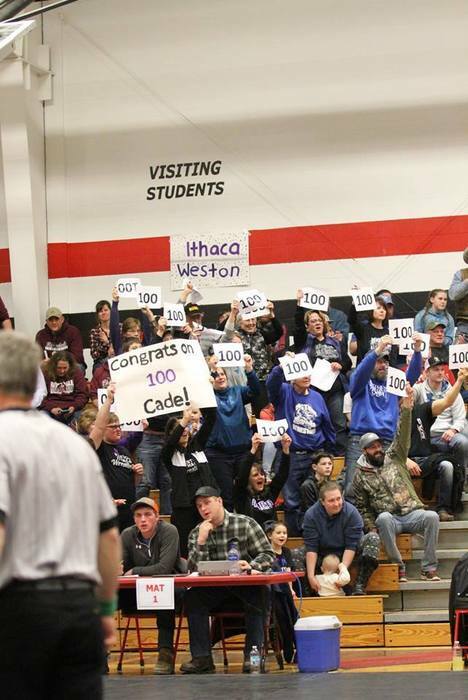 Cade added to the wrestling excitement by earning his 100th win. Way to go! The 7th Annual “Caps for Causes” will be held on Wed., Feb. 13. For a $5 donation, students and staff may wear a hat in school all day (school appropriate of course!). All money raised goes to local families and organizations in need. We have always had great success with this event. Please help the Letterman’s Club again to achieve amazing things for our community! Attention Little Dribblers families! Little Dribblers is cancelled for tomorrow. A reminder to all regarding upcoming School Board meetings and special sessions: Feb. 12 there will be a School Board meeting at 7pm in the LMC with the Finance and Personnel Committee meeting prior at 6:30. The Mission and Vision special meeting is Feb. 19 at 6pm in the Commons. Two Thursdays in a row we have cancelled school. Just because we don't have students in the building doesn't mean we can't take a trip down memory lane. 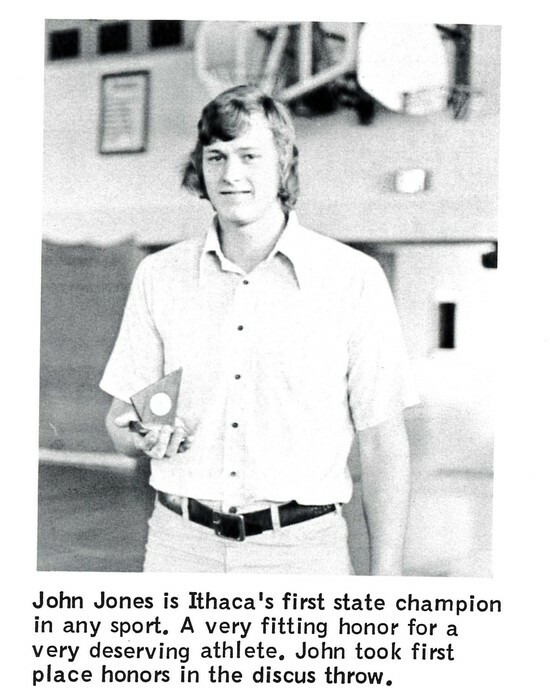 Here is a photo honoring Ithaca's FIRST state champion in ANY sport. In what yearbook (year) was this printed? NO Fellowship of Christian Athletes this morning due to the late start - next Huddle gathering Feb 21st! Thanks!! Today is Thursday, February 7, 2019. Due to icy roads, Ithaca has a 2 hour delay. Today is Thursday, February 2, 2019. Ithaca has a two hour delay. Reminder! The 7th Annual “Caps for Causes” will be held on Wednesday, February 13, 2019. For a $5 donation, students and staff may wear a hat in school all day. (school appropriate of course!) All money raised goes to local families and organizations in need. We have always had great success with this event. Please help the Letterman’s Club again to achieve amazing things for our community! Ithaca Middle School students traveled to UW-LaCrosse today for the MathCounts competition. Forensics Team: Monday, February 18 is showtime! Make sure that you work on your own and sign up with coaches this week as often as possible. Extended practice times are available this Saturday; take advantage of this opportunity to perfect your performance. See Mrs. Murphey to set up a time or with any other questions. FCA (Fellowship of Christian Athletes) Huddle will be tomorrow morning, Thursday February 7th, 7:00 a.m. in Ms. Sprecher's room. Start your day and join us for a Big Breakfast, fellowship and an inspiring devotion & message! All middle and High School students are welcome! Bring a friend! Ithaca has a digital library, and your child can access it now! Please see the attached picture for all the details and HAPPY READING! Ithaca-Weston Wrestling earned its first conference tournament title last weekend out of eleven teams. I-W earned first place out of eleven teams by claiming four weight class championships: Riley Astle (W-Jr.), Colton Clary (I-Sr.), Leo Garcia (I-Sr.), and Cade Nettesheim (I-Sr.); three runner ups: Logan Clary (I-Jr.), Monty Jennings (W-Jr.), and Sawyer Willis (I-Jr.); two third place winners: Will Burnley (I-Fr.) and Trevor Templen (I-Fr.). New Lisbon was 30 points behind for second place. The 5th - 8th Grade Band students attended the UW Madison Varsity Band Concert at the Overture Center on February 1st. Thank you, Mrs. Behrens for helping our musicians grow in their appreciation of music! A reminder for parents and students: Student Handbook regarding Cell Phone Use (page 6) USE OF PHOTOS/VIDEO All forms of technology used for digital pictures/movie devices: possession/use of a camera, digital picture/movie devices, to include but not be limited to picture telephones, digital cameras, camera recording devices, etc., are prohibited from entering any locker room, changing room, bathroom area, and classrooms on school grounds except for official school purposes. This is in compliance with Wisconsin Statute 118.258. It's time for the second boxtops and milkcaps collection! Elementary students bring in your items by February 15 so they can be sorted and counted. Remember: the class that collects the most gets a treat at the end of the year! Attention all Ithaca Families and Friends: The Ithaca PTSO is sponsoring a Roller Skating Party on Sunday, February 10 from Noon - 3 PM at the Galaxie Skate Center. Cost is $5 per person and $2 for skate rental. Hope to see you there! The Developmental/4K team is looking forward to seeing our future Bulldogs tomorrow for screening! Appointments that were canceled this week will be made up on Thursday, February 21st. If you have any questions regarding this, please contact the school at 585-2311. There will be no school for 4K students on Thursday, February 21st due to rescheduling of the Developmental/4K Screening that was canceled this week. Parents, please make alternate plans for your 4K child on this day. Thank you for understanding! 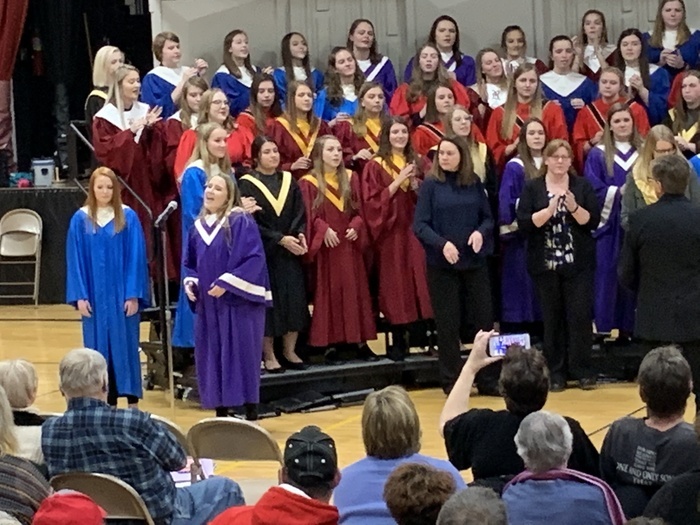 Last Sat., Jan. 26th was our conference Junior High Honors Choir. These talented singers rehearsed with guest directors, learning techniques and meeting other area singers. Thank you to Mr. Braatz for developing and encouraging our district musicians. 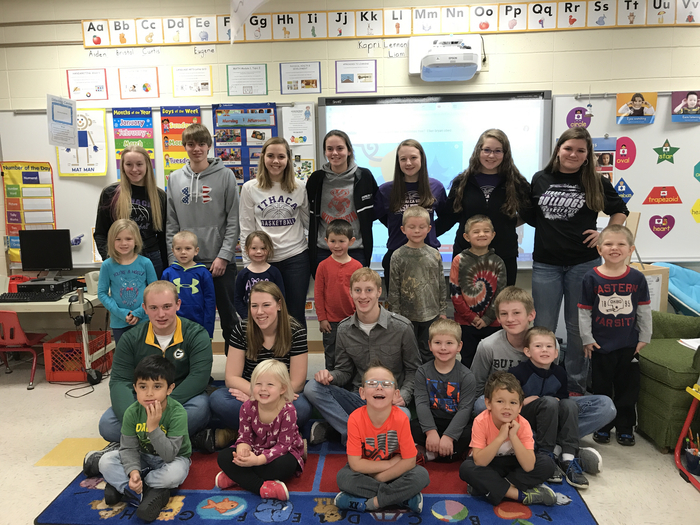 Participants were: Brooklyn Freestone, Evan Gomez, Josie Laue, Alana Nelson, Elise Newkirk, Paige Nowicki, Erica Steinmetz, Landon Thompson. 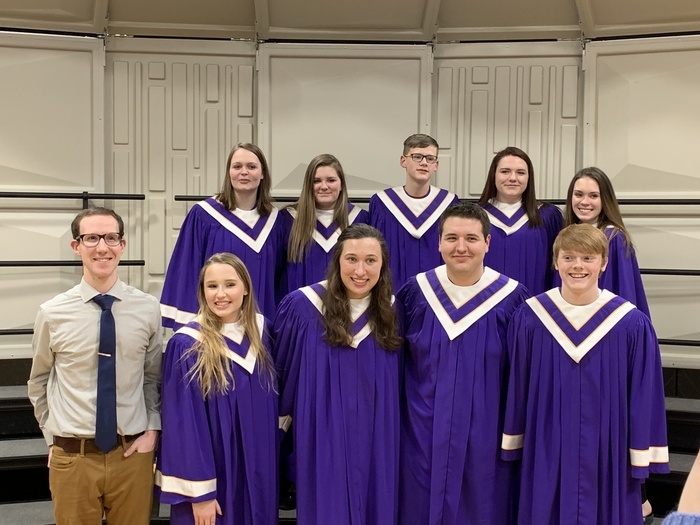 Last Sat, Jan. 26th was our conference High School Honors Choir. These talented singers rehearsed with guest directors, learning techniques and meeting other area singers. Thank you to Mr. Braatz for developing and encouraging our district musicians. Olivia Duell performed a solo during the performance as well. Area instructors even joined their students for a song. 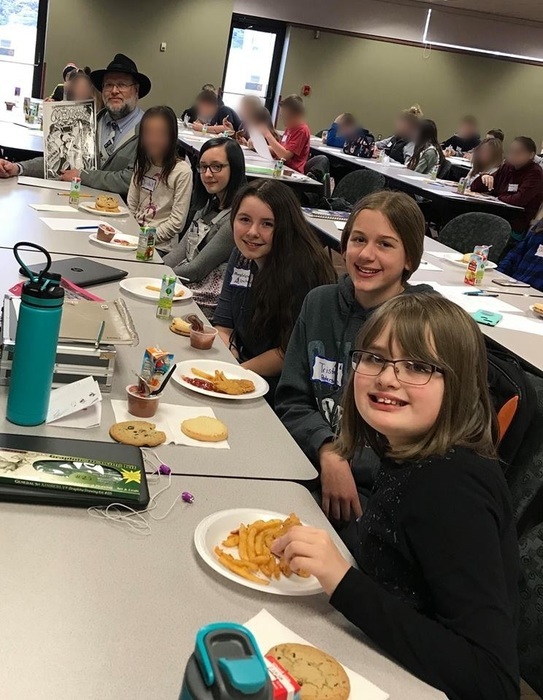 Ithaca participants were: Kierra Atkinson, Megan Brisbois, Ira Coppernoll, Olivia Duell, Ryan Ghastin, Aubrey Olson, Diego Ortiz, Jaci Rosenow, Karissa Willis. Finals will be completed on Monday, February 4, 2019. Due to the snow and cold the second day of finals has been pushed off until the 4th. 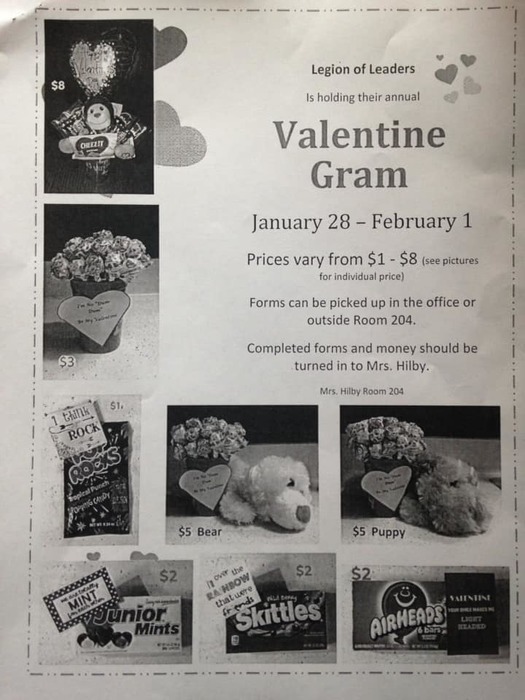 Just a reminder....if you are ordering any Valentine Grams to turn in your orders tomorrow, February 1. 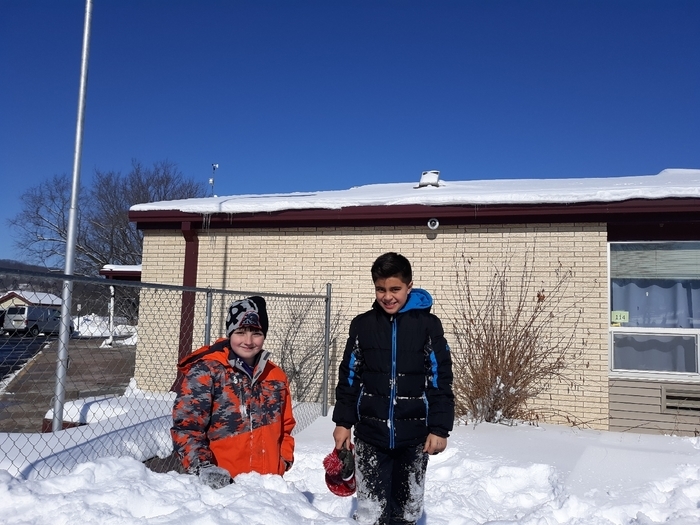 Sam Hilby will be collecting around 9:30 a.m. Due to the weather and snow days Sam will also be extending the collection through Tuesday, February 5 in order to give the 4K classes time to participate if they would like. So any and all finals orders are due Tuesday before 9:30 a.m. 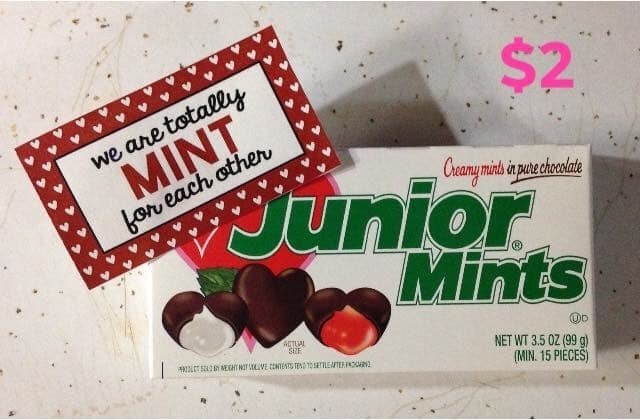 If you know you are planning on ordering junior mints, the monkey arrangement, or the puppy/bear and won't be able to turn the order form in until Monday or Tuesday please message Sam and let her know the quantity as She wants to be sure to get those items, as quantities may be limited. Please spread the word. ​Ithaca Schools is closed on Thursday, January 31, 2019. 4K screening is also cancelled. Developmental/4K Screening will be cancelled on Wednesday, January 30th. Parents will be contacted by phone or District announcement when a make-up date is determined. Thank you! Do not forget that Ithaca has an alert system to report anything that affects school: https://ithaca-wi.safeschoolsalert.com/ Log on and share all the great things (or any concerns) at Ithaca on your cold/snow day! ​Due to the freezing temperatures, Ithaca will be closed Tuesday, January 29, 2019. The Ithaca Vision and Mission planning for tonight, January 28, 2019 has been cancelled. Ithaca Schools will be closed Monday, January 28, 2019. All after school activities are canceled. Today we accidentally sent out a reminder about our spaghetti dinner, sponsored by the horse club. This event was held Friday night. We apologize for any inconvenience. Toasty we accidentally sent out a reminder about our spaghetti dinner, sponsored by the horse club. This event was held Friday night. We apologize for any inconvenience. Let us cook for you!! The Ithaca/RC Horse Club team and parents will be serving spaghetti dinner Friday, Jan 25, in the Ithaca High School Commons. Serving starts at 3:30 and carry outs will be available. Come to support the members, have a great meal, and then stay to watch our own Ithaca Girls and Boys basketball teams. Hope to see you there!! The Ithaca 4K team is looking forward to meeting our future Bulldogs at screening next week! If there are any weather-related delays or cancellations for our school district, the screening team will be in touch to reschedule. If not, we look forward to seeing you then! 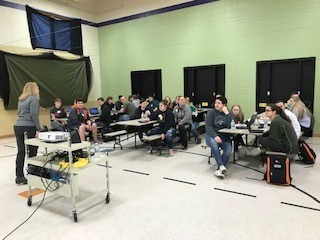 Today 8 Ithaca Middle Schoolers tested to see which one student would represent Ithaca in the state qualifying Nat Geo Bee online test. Placing 3rd was Kaylee Peterson, 2nd place was John Clary and placing 1st and earning the honor to represent our school was Alivya Young. Other participants were Lincoln Manning, Gavin Templen, Danny Feryance, Kaylee Miller, and Ruthie Weitzel. Congratulations everyone! Help support one of our district families! 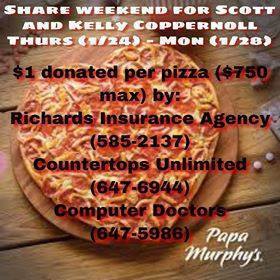 Join Richards Insurance Agency, Computer Doctors, Papa Murphy's Pizza, and Countertops Unlimted in supporting Scott and Kelly Coppernoll and family. Today through Monday, each business will donate $1 per pizza and Papa Murphy’s (649-7272) will donate 15% of sales. Attn Students in grades 3-12: The next game club will be today after school until 4:50. Meet in the commons after school for a healthy snack and then we'll head to the multi-purpose room for games. Attention High school students! Final exams for tomorrow (Thursday )will include the following hours. 2,4,6,8. Middle school students will follow this same schedule however they will not have exams. On Monday January 28, we will have final exams for hours 1,3,5,7. This will then conclude our semester. Choir students will not be attending honors choir at Riverdale tomorrow. ​Today is Wednesday, January 23, 2019. Ithaca school district is closed. ​Ithaca School district will be closed today, January 22, 2019. ​Ithaca School district will be closed today, January 22, 2019. 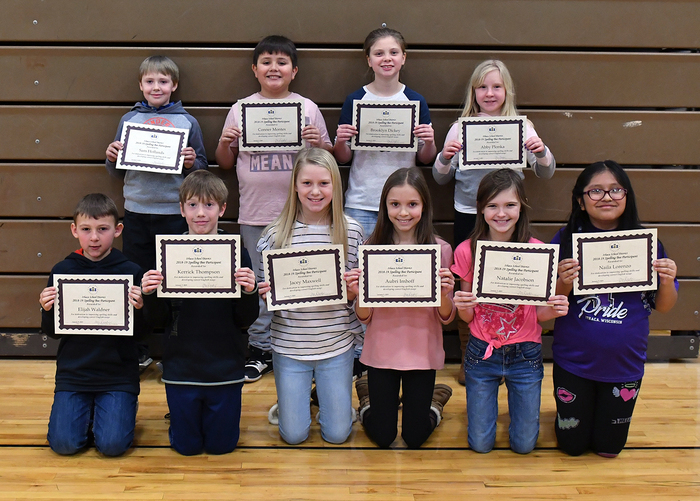 The West Sectional Spelling Bee scheduled for tomorrow at Prairie du Chien has been postponed to Tuesday, January 29 at 10 AM. Today is Monday, January 21, 2019. Due to the inclement weather, Ithaca School District will have a two hour delay. Attention - Little dribblers is cancelled for tomorrow due to anticipated weather. Today is January 18, 2019. Due to the projected storm, Ithaca Schools will be closing early. Elementary will dismiss at 1:20 and Middle and High School will dismiss at 1:30. Today is Friday, January 18. Ithaca schools will be cancelling all after school activities. 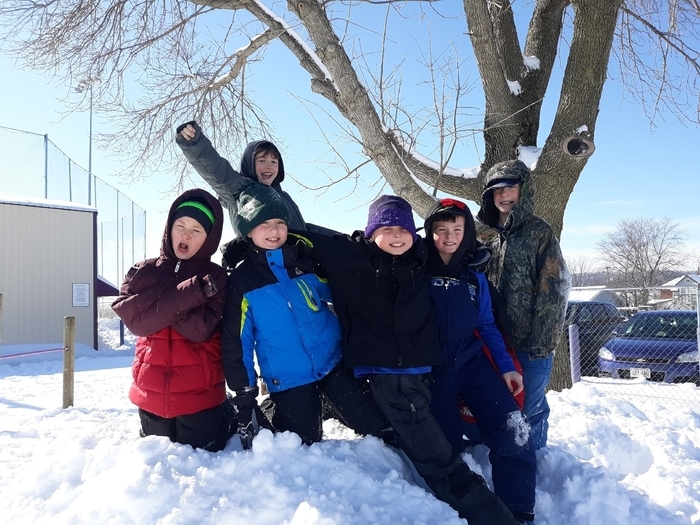 Due to the impending weather, there will be no after school games or practices. This morning Ms. Sprecher's Career class took part in mock interviews with professionals from our community. Students developed resumes and interview skills to prepare for the day. Thank you to the interviewers for taking time to give your expertise to our students! DeAnna Jelinek, Pam Kaufman, Ashley Toussaint, Katie Burnley, Dave Schoen, Dana Francois and Julie Doudna. Five 6th graders had the privilege of meeting with local cartoonist John Mundt who gave sage advice in developing storylines, characters, and drawings to our future authors. The Young Authors Workshop was part of CESA 3's gifted and talented consortium programming and was held at SWTC. Ithaca has room in most classes for open enrollment. If you would like your child in 4K at Ithaca, please call for an appointment for screening. FBLA’s Dessert Friday is back! Tomorrow the famous donuts will be sold for $1.00 with all proceeds going to support the March of Dimes. They will be sold ONLY at 9:45 (during ATTACK, after breakfast is served) and at lunchtime after lunch has been served. Don't forget! If you know anyone who has a child that will be 3-years-old or 4-years-old on or before September 1st and would like to have their child attend school at Ithaca, please share this information regarding screening with them. Screening will be Jan 30, 31, Feb 1. Attn Students in grades 3-12: The next game club will be Thursday, January 24 from after school until 4:50. Meet in the commons after school for a healthy snack and then we'll head to the multi-purpose room for games. Elementary students remember to turn in a permission form to your teacher. Hope to see you then! It's Throwback Thursday again! 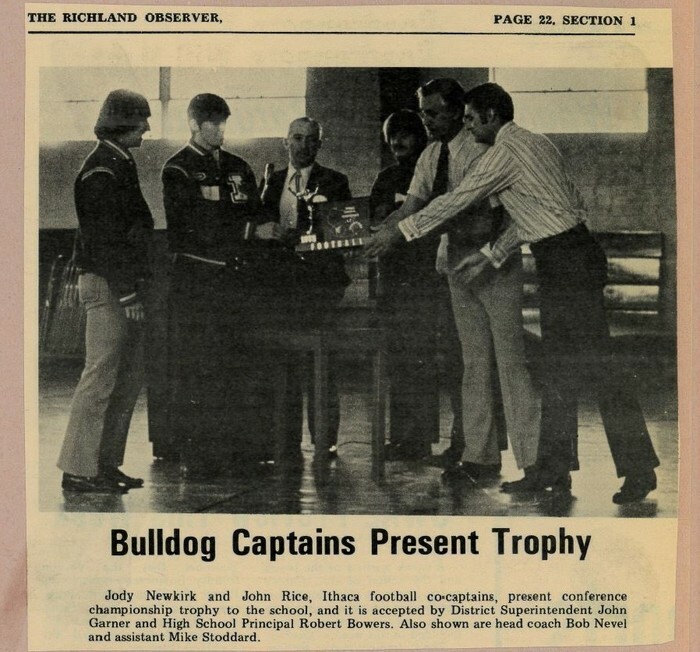 We all recognize the names: Jody Newkirk, John Rice, John Garner, Robert Bowers, Bob Nevel and Mike Stoddard - but do you know the year? The photo was published in the Richland Observer. High School students! Are you interested in health care or general education courses for college? Check out this opportunity starting in the fall through Southwest Tech. Deadline for applications is February 15! Let us cook for you!! The Ithaca/RC Horse Club team and parents will be serving a spaghetti dinner Friday, Jan 25, in the Ithaca High School Commons. Serving starts at 3:30 and carry outs will be available. Come to support the members, have a great meal, and then stay to watch our own Ithaca Girls and Boys basketball teams. Both gyms will be rocking! Hope to see you there!! All after school activities tonight have been cancelled. This includes the home Middle School, Varsity Reserve and Varsity Girls Basketball games. The Ithaca @ Cashton boys basketball game for tonight has been called off. Today is January 15. Ithaca has a 2 hour delay. Reminder: There is a School Board meeting tonight in the LMC at 7pm. All are welcome to attend. The agenda is available on the school's website. The January PTSO meeting will be held Wednesday, January 16 at 3:30 p.m. in the LMC. We hope to see you there! Reminder: There is a School Board of Education meeting on Monday, January 14th at 7pm in the LMC. All are welcome to attend. The 7th Grade worked to create cell models for Mrs. Willis' class. Here are some examples of their hard work that were presented this week. The 7th Grade worked to create cell models for Mrs. Willis' class. Here are the remainder of the examples of their hard work that were presented this week. The Ithaca Lions would like to thank the staff and students at Weston School, St. Mary's School and Ithaca School for their cooperation in our Eye Screening. We also did Kids Safe at Ithaca. We screened 399 students and 21 were referred for further care. We take great pride in being able to provide this service to our schools. A great big thanks to the Ithaca Lions from the staff and students at Ithaca Elementary School! 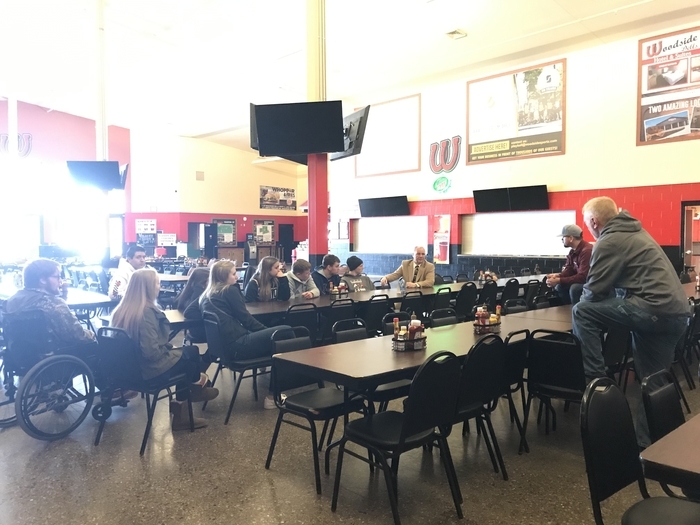 Mrs. Sprecher's Food students recently took a field trip to the Richland Locker to see the way meats is cut up and processed as part of their unit on meat. The kids asked a lot of good questions and will have a better understanding of where cuts of meat come from and how to select and prepare meat for their dish. The kids especially enjoyed the snack sticks Craig Huth gave us at the end of the tour. A very big THANK YOU to Craig Huth and the Richland Locker for hosting! Reminder! There is a wrestling sign-up today for 4K-2nd grade boys and girls in the multi-purpose room at 7 p.m.
Today's Throwback Thursday takes us to a BADGER CLASSIC football game against Iowa Grant at Camp Randall Stadium. What year was this? (we will except the year of the game or the year the picture appeared in the yearbook). By the way, the Bulldogs WON 31-12. Youth Wrestling! This Thursday, January 10 there is a wrestling sign-up for 4K-2nd grade boys and girls in the multi-purpose room at 7 p.m.
Juniors will be taking part in a Mock ACT Test this Wednesday, January 9th. We will meet in the commons at 8:50a.m. and walk to the church together. Testing will be done by lunch time. Please bring approved calculators and #2 pencils with you that morning. The 2019 Ithaca School Spelling bee for students in grades 4-8 will be held this Wednesday, January 9 starting at 8:30 in the gym. All are welcome to join us in watching our top spellers compete to go on to Sectionals at Prairie du Chien. Reminder for Parents: The KidCare Photo ID provides parents with information necessary to have handy if their child were ever lost or abducted. On Wednesday, January 9, Ithaca Lions and the Richland County Sheriff’s Department will be providing this service again to our families. If you have and can find, please send the KidCare blue book to your child’s teacher for it to be updated on January 9. It will then be returned to you. If you have any questions about the project, please feel free to contact Meredith Bevan or Kathleen Schoen at 585-2311. Seniors need come to the office and write your name the way you want it to appear on your diploma. Getting closer! Our Developmental/4K Screening is at the end of January/early February this year. If you have a child who is turning 3-years-old or 4-years-old on or before September 1st, call the office at 608-585-2311 to make an appointment! For more information, reference the attached flyer. Attention Little Dribblers families! Little Dribblers is cancelled for tomorrow January 5. We will practice again on January 12. Good morning. Be sure and join Ithaca’s Social Media feeds for a new and fun game next week. Starting this Tuesday we will offer TRIVIA TUESDAY's. We will present fun, obscure, and unique trivia questions concerning all things Ithaca. 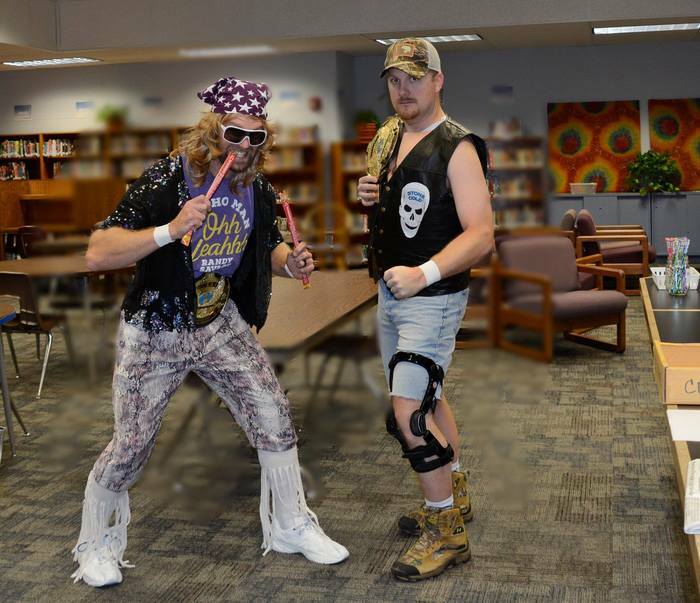 Trivia Tuesday’s and Throwback Thursday’s from Ithaca Schools! 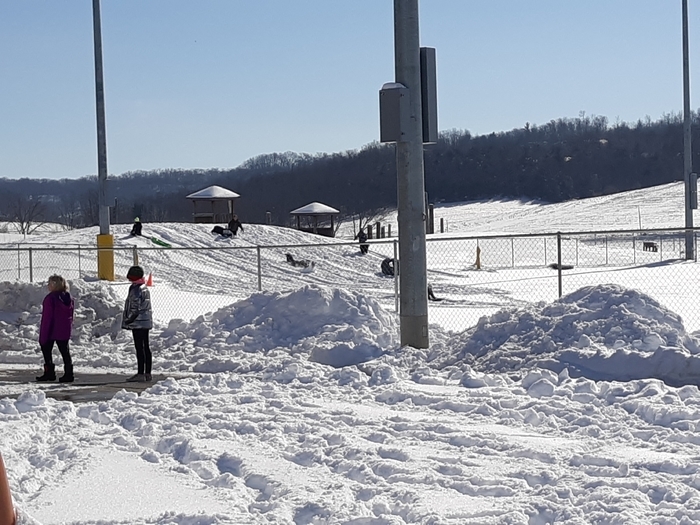 The sledding hill is OPEN!!!! Our Lady Bulldogs take on the Weston Silver Eagles in basketball action tonight at home. Come on out and cheer them on! JV begins at 6pm, Varsity at 7:15pm. Throwback Thursday time is here! It was an era of short basketball shorts and feathered hair. What year did this picture land in the Ithaca yearbook? The Buildings and Grounds Committee and Policy Committee meetings originally scheduled for this evening will now be held on January 9th at their previously scheduled times. Our school calendar on the website has been updated to reflect the changes. 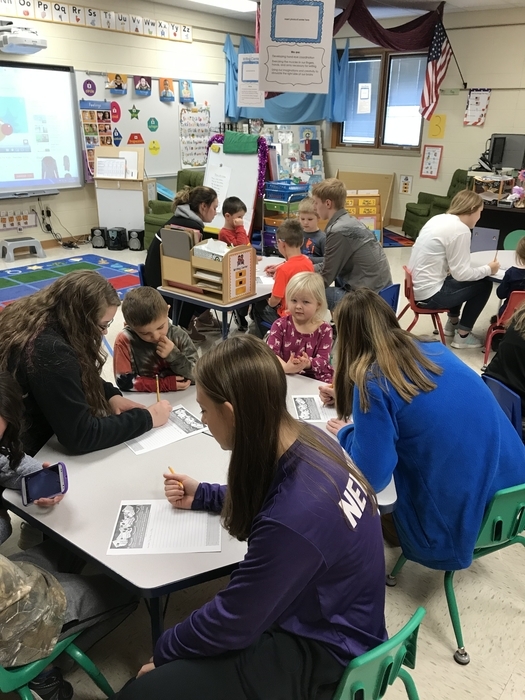 The Ithaca Lions Club sponsors the KidCare Photo ID Project in our school, providing parents with a free standardized, high quality instant photograph of their child in an ID booklet. The KidCare Photo ID provides parents with information necessary to have handy if their child were ever lost or abducted. On Wednesday, January 9, Ithaca Lions and the Richland County Sheriff’s Department will be providing this service again to our families. If you have and can find, please send the KidCare blue book to your child’s teacher for it to be updated on January 9. It will then be returned to you. If you have any questions about the project, please feel free to contact Meredith Bevan or Kathleen Schoen at 585-2311. Good morning and welcome to our final day of Winter break. We will welcome students back to class tomorrow. Speaking of tomorrow, after taking a winter break of it's own, our Throwback Thursday photo share will happen again tomorrow - stay tuned! Happy New Year from Ithaca Schools! See you back on Thursday, Jan. 3rd! Introducing....Mrs. Juli Thompson! Juli will be our new Library Assistant, beginning January 3rd. She will be taking the place of Mrs. Ziemke, who is retiring. Welcome, Mrs. Thompson! The Ithaca School District has items for sale on Wisconsin Surplus. We have two buses, one aerator, and two interior wooden doors. Visit the following website for more information: www.wisconsinsurplus.com and then simply search ITHACA. Each year, the The Ithaca High School students have collected items for Passages. This year the high school Student Council held a competition between all of the school classes. The freshman came out on top with the most items collected! A total of 979 lbs. of non-perishable food items and toiletries was given to Passages this year! Thank you to all who were involved...it is so appreciated! One last reminder...please go to the Ridge and Valley Sports Schedules link on our website, listed under MS and HS SPORTS INFO. 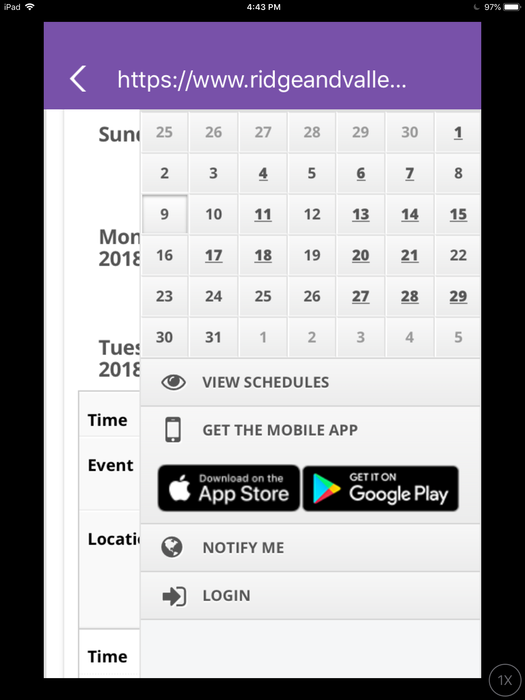 Download the app for all of your up to date WIAA Ithaca sports events! We will continue to post the current elementary practices on our EVENTS feed, but hope to remedy this soon, with a calendar link. Thanks for your patience! There is a bag tournament going on right now at Ithaca. Great "wind down" time for teachers, students and administrators getting ready for the Christmas break. Mr. Braatz preparing to spread some Christmas cheer in the Multi Purpose Room this morning. The Ithaca Basketball Apparel is in. Please get in contact with Coach Klang to make arrangements for your pick up of apparel. Coach Klang will be available all day Today (Friday) during school and after school until 4 P.M. Contact Coach Klang at school. Pave the Patio: Don't forget! There's just 2 more days left during our holiday sale to purchase your brick for our school patio project. If you have any last minute holiday shopping, these would make wonderful gifts! Please order online at https://www.thatsmybrick.com/i... or contact Jenna Wipperfurth by December 21 to create a unique and memorable gift to last a lifetime! Notice! Please come out to support the High School Boys’ and Girls’ Basketball teams when they host a Culvers share night on December 26th from 4-8 PM at the Richland Center Culvers. Attention Middle and High School students doing Battle of the Books: This is a reminder to check out some books to read over Christmas break. We will meet briefly when we get back from break to discuss the contest and how to study on Moodle. Any questions, contact Mrs. Plonka. FYI: Wednesday's winner of $100 in the Band Parent's Calendar Raffle was Chris Gunderson, with ticket #460. Good morning, it is 7 AM Central and time to Throw it Back! In honor of Forensics season starting, our Throwback Thursday photo takes us back to the Forensics team of years gone by. What year did this picture grace the pages of the Ithaca yearbook? Forensics Team: If you haven't met with a coach yet, please do so Wednesday or Thursday this week. Speech writers, be sure to work on your research over the break. See Mrs. Murphey if you have any questions. FYI: Tuesday's winner of $50 in the Band Parent's Raffle was Kolby Hilleshiem, with ticket #651. Help Ithaca Pave the Patio! Don't forget! There's just 3 more days left during our holiday sale to purchase your brick for our school patio project. If you have any last minute holiday shopping, these would make wonderful gifts! Please order online at https://www.thatsmybrick.com/ithacawi or contact Jenna Wipperfurth by December 21 to create a unique and memorable gift to last a lifetime! Middle School Wrestling will start after the break on Jan. 3rd according to Coach Anderson. FYI: Monday's winner of $50 in the Band Parent's Raffle was Mrs. Schoen, with ticket #338. Throwback Thursday is now just 2 days away! We will share a picture of Ithaca past and have you guess the year of the photo. We look forward to discussing Ithaca memories this Thursday! Don't forget: all of our Ridge and Valley WIAA sports can be found on the link under SPORTS on the middle and high school pages on our websites. They also have their own APP that can be downloaded to stay up to the minute! Please come out to support the High School Boys’ and Girls’ Basketball teams when they host a Culvers share night on December 26th from 4-8 PM at the Richland Center Culvers. Please note: Tomorrow is the second day of Christmas dress up and all in Ithaca are invited to wear Christmas colors or Christmas patterns. Show us all your fashion flare from shirts to pants and socks! FYI: The weekend winners in the Band Parent's Calendar Raffle were Becca Keller - $75, Marj Willis - $50, and Sharon Long - $75. 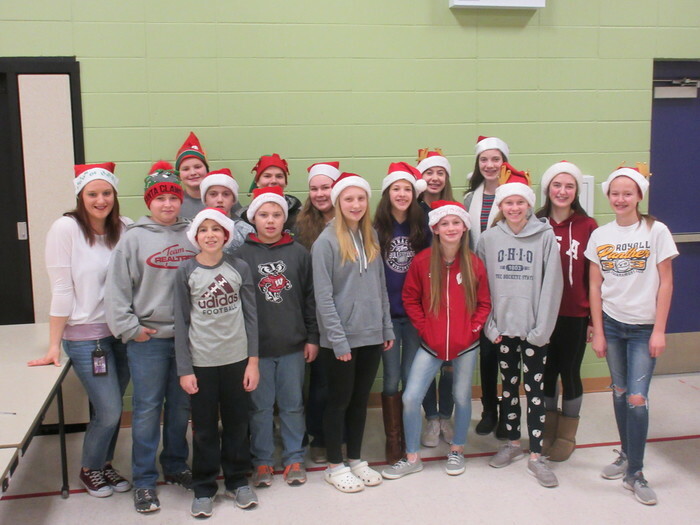 For the Five Days of Christmas, the Ithaca students and staff dressed up in holiday cheer.... Monday kicks off our week of holiday fun with Holiday Hat Day. Wear your favorite holiday hat, like a Santa hat, elf hat, character hat. We can't wait to see your creativity!!! Choir students make sure to pick up your fruit from the annual fruit sale Saturday at Oakwood Fruit Farm from 8:00-10:30. Students must pick up by 10:30 Saturday morning. Reminder to elementary students/parents: Please bring your Elf Shop money for next week's holiday shopping. FYI: Thursday's winner of $50 in the Band Parent's Calendar Raffle was Becky Durst, with ticket #251. 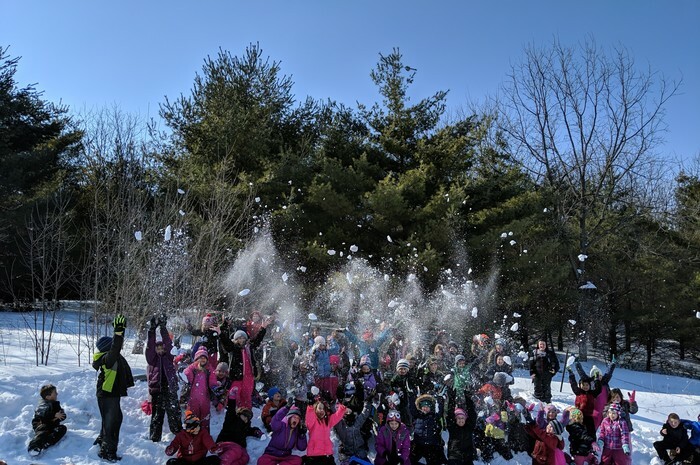 Notice to elementary parents: Tomorrow is the day we go to the School Forest. Please send children in appropriate attire. Hats, gloves, coats, snow pants, and boots. If you are unable to provide these items please let the teacher know ASAP. Otherwise, children that are not dressed appropriately will not be attending the school forest. FYI: Wednesday's winner of $100 in the Band Parent's Calendar Raffle was Stacie Roen, with ticket #685. Ithaca has a PLC Day today which means an early release for students. School will release at 1:10 pm this afternoon. Notice! Tonight's middle school basketball practice is cancelled. Ithaca apparel orders from Iverson Designs (PTSO) will be available for pick up on Friday, Dec. 14, from 3-6 PM in the Ithaca Commons. If you are unable to pick up at this time, please contact Jill Plonka to set up another time. Thank you! FYI: Tuesday's winner of $50 in the Band Parent's Calendar Raffle was Hailey Boon, with ticket #17. The Ithaca FBLA is participating in a fundraiser for Dormco.com. Click on the link below to shop for your students dorm room, or for yourself! They offer a variety of home goods. Each Senior at Ithaca will be receiving a gift card towards a purchase. Any purchase made through this link http://www.dormco.com/?Click=333164 Will result in a 10% return to the Ithaca FBLA chapter. Enjoy shopping!! Notice! There will be a Winter Band Concert on Tuesday, December 18th at 2:00 pm, or as soon as the Elementary Concert gets done. Grades 5 - 12 band students will be featured. Throwback Thursday is just one day away. We will post a pic from Ithaca's past, and we want you to guess the year. HINT: Tomorrow, we will be traveling back in time to look at a senior class that gathered donations of food and money for Passages. NOTICE! Winter weather may cause issues... 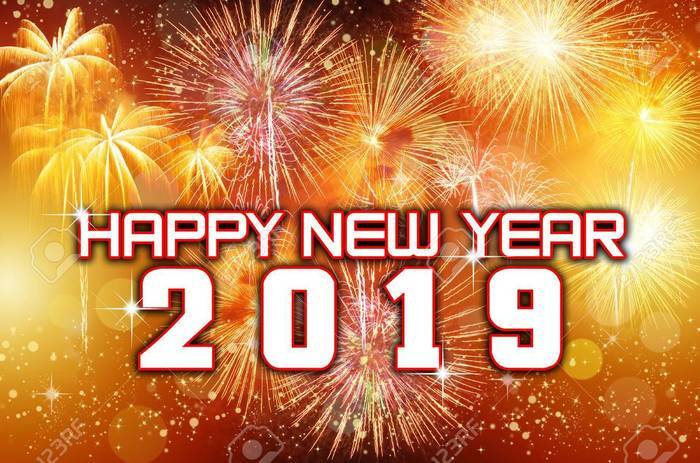 Please stay tuned to our FB page, our Twitter page, our app, WRCO radio, and the Madison television stations for the latest updates and announcements! It's T-shirt night! Come show your support at the Wrestling Dual Meet tonight against Westby and get a free wrestling T-shirt while supplies last. Be sure and join us on Thursday for another round of THROWBACK THURSDAY. We post the pic and you guess the year. January "at a glance" calendar. May not be entirely accurate, so please keep checking the Events! Notice to seniors: If you are planning to apply to UW Richland or UW Baraboo, your application fee will be waived during the month of December.. If you are planning to apply to UW Platteville, the ACT Merit Scholarship criteria has changed at this time. You will be eligible for a $1,000 Scholarship with an ACT score of 23 or higher. So many houses were built Friday at the annual Gingerbread House Building event. Thank you to all who attended, participated, or helped judge the creations!! Tastiest Prize went to Alex Touissaint for the use of the most types of candy/food on his house. Most Creative went to Ariel, Trista, and Chelsey O for installing a pool, firepit complete with kids holding marshmallows and colorful pink siding. Most Traditional House was Candy Cane Lane by Zander, Kayden and Wesley N. Great job and looking forward to next year!! Reminder! The Winter Choir Concert will be held tonight at 6:30 in the gym. All are welcome to attend to hear Winter and other styles of music, sung by the middle and high school choirs. FYI: The weekend winners in the Band Parent's Calendar Raffle were Tim Willis - $75, Samantha Swenink - $50, and Amy Fry - $75. 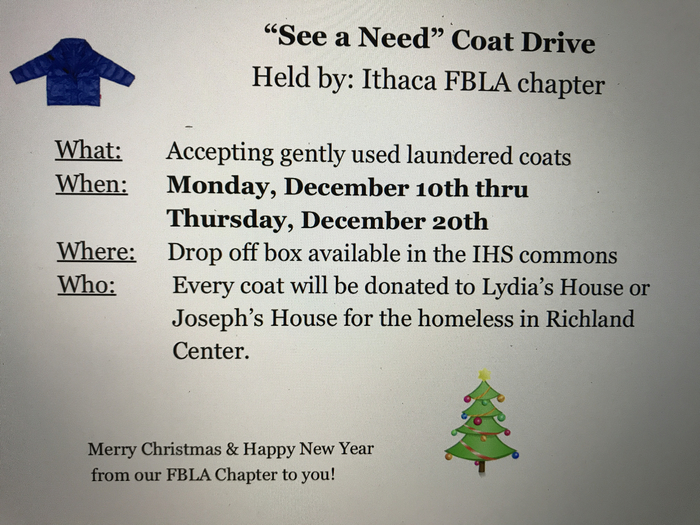 FBLA Coat drive. Please see attached flyer. The annual food drive put on by Student Council and the NHS starts Monday December 10, and goes through December 21. Bring your donations to your classroom, or the Commons, and student council members will collect items during the week. This year we are making the food drive competition a school wide event. The top three classes throughout the elementary, middle, and high school who collect the highest weight of items will get a pizza party during lunch. Please note: water will not be accepted as a donation. Thank you for your support and donations to the less fortunate people in our community! The Vegge Entrepreneurs will be selling microgreens in the commons after school today (Friday) - stock up! FYI: Thursday's winner of $50 in the Band Parent's Raffle was Amy Gander, with ticket #43. If you are looking for something to do on Saturday, come to the State Capitol and hear some of our students playing Christmas Carols in the Tuba Christmas Concert at 2:30 pm. The following students will be performing with approximately 150 other tuba and baritone players from the Madison area: Andrew Mueller, John Honer, Taygan Ryan, Chase Keller and Ty Kershner. Today in 6th grade Science, we hosted a screening of the new National Geographic Documentary, Science Fair, What's the Big Idea? When you get the opportunity to see this movie, prepare to be inspired. Our future is brighter when our young students are science-inspired. #ScienceFair Hailed by critics as “immensely likeable,” “brilliant and quirky” and an “ode to the teenage science geeks on who our future depends,” SCIENCE FAIR follows nine high school students from around the globe as they navigate rivalries, setbacks and, of course, hormones, on their journey to compete at The International Science and Engineering Fair. Thank you to National Geographic for helping us to inspire our science students by providing free, early release of this movie to science teachers. Notice! Youth wrestling sign-up for all 3rd – 5th grade boys and girls will be tonight, at 6 p.m., in the multi-purpose room. Youth wrestling sign-up for all 4K-2nd grade boys and girls will be Thursday, January 10th at 7 p.m. in the multi-purpose room. FYI: Wednesday's winner of $100 in the Band Parent's Calendar Raffle was Andy Dearborn of Muscoda, with ticket #645. 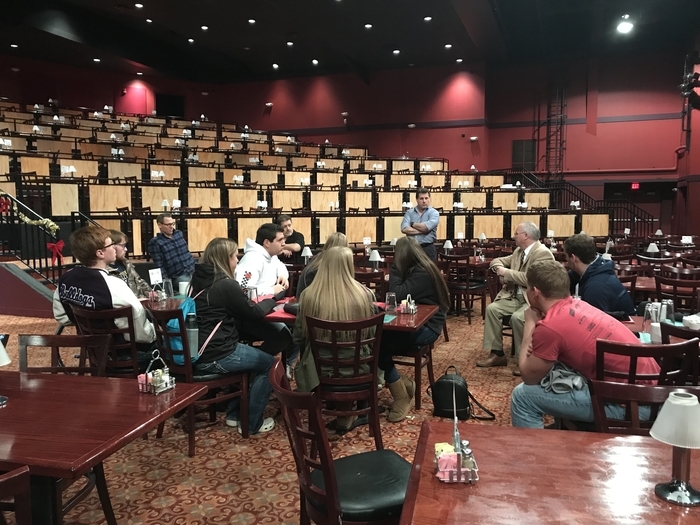 The Sports & Entertainment Marketing class toured and spoke with management at Woodside Sports Complex, Chula Vista Resort and the Palace Theater in Wisconsin Dells. The Ithaca Lions Club will be doing eye screening and Child Find booklets. FYI: Tuesday's winner of $50 in the Band Parent's Calendar Raffle was Kathleen Schoen, with ticket #337. FYI: Monday's winner of $50 in the Band Parent's Calendar Raffle was Steph Mueller, of Owen, WI. Students from 4th and 5th grade participated in CESA 3's Math 24 competition yesterday at Southwest Tech. Everyone won a round at their table and earned a "chip". The PTSO's Gingerbread House Fun Night has been rescheduled for this Friday, December 7, starting at 5:30 in the commons. Judging will be at 6:45 and prizes will be given to 1st, 2nd, and 3rd places. Bring candy to share! Thank you and hope to see you there!! 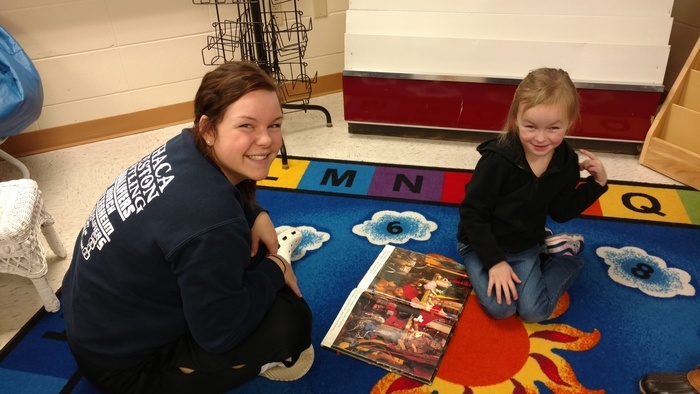 On Wednesday and Thursday of last week, the FBLA students helped the 4K write letters to santa and then read to them. These are some pictures from Wednesday. REMINDER! High School students who are interested in joining our Forensics team should meet in Mrs. Jump's room tomorrow, December 4th, during attack time. Hope to see lots of you there! Congratulations to Elise Newkirk, second place winner of the VFW's Patriot's Pen essay contest! Elise wrote an essay about why it is important to honor the American flag. There were several entries from Ithaca, and other schools as well. Way to go, Elise! Tonight's PTSO Gingerbread House Fun Night has been CANCELLED due to the weather. Stay tuned for the reschedule date! We just heard from AD Dan Rice and the Kickapoo Middle School boys basketball tournament has been cancelled for today. Ithaca was to take part in the tourney. Please note! We have only one more week to collect items for our Salvation Army family. Please give Mrs. Wontor your donations. Everything must be in by December 6. Thank you for your generosity! The NHS will be selling Pizza Hut pizza and pies by the slice at concessions for tonight's boys' basketball game. Come and enjoy a slice and help us buy new stoles for graduation! We had a lot of fun today with our throwback Thursday school photo. We will do it again next Thursday. Don't forget to follow us on twitter @IthacaSchool and download our app. 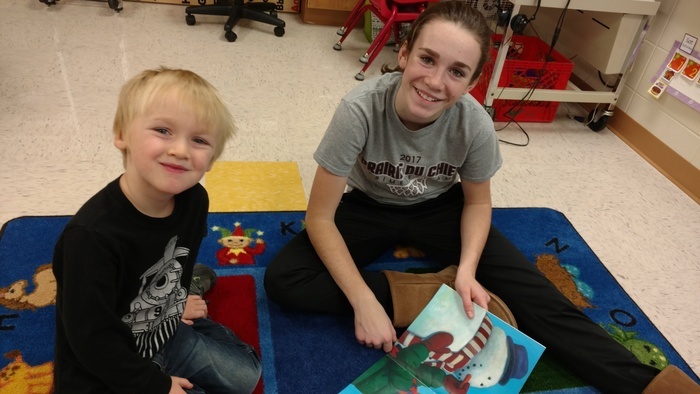 FBLA students help 4K write letters to Santa. It's THROWBACK Thursday at Ithaca. Can you name the year of this FBLA photo. And yes...the original is in black and white also. Notice! High School students who are interested in joining our Forensics team should meet in Mrs. Jump's room on Tuesday, December 4, during attack time. Hope to see lots of you there! Good morning everyone. Did you know you can follow Ithaca School on Twitter? Thats right, simply follow us @IthacaSchool - See you on Twitter! We are proud to announce the launch of our all new website. Visit www.Ithaca.k12.wi.us and check it out. Oh, and if you haven't downloaded our new app yet it is available at the Google Playstore and Apple App Store. Attn Students in grades 3-12: There will be a Game Club night on Thursday, November 29 from after school until 5 PM. Meet in the commons after school for a healthy snack and then we will go to the Multi-purpose room. This is where you can be picked up at 5 PM. Reminder! Come one, come all! It's time for the 2nd Annual PTSO Gingerbread House building contest! It will be held Saturday, December 1, starting at 5:30 in the Commons. Frosting, graham crackers, and milk cartons to support your creation will be provided - families/groups need to bring decorations - enough to share please - and a base to build your house on like a cookie sheet or a piece of cardboard wrapped in aluminum foil. Judging will be at 6:45 with prizes for the 1st, 2nd, and 3rd place creations. Hope to see you at this FREE event! Reminder! Attn Students in grades 3-12: There will be a Game Club night this Thursday, November 29, from after school until 5 PM. Meet in the commons after school for a healthy snack and then we will go to the Multi-purpose room. This is where you can be picked up at 5 PM. Elementary students please fill out the permission form and get it back to your teacher by tonight, the 27th, please. The NHS is hosting a Salvation Army family for Christmas. Please check out the list of needed items under the Christmas tree in the commons. Items included red and blue superhero toys, arts and crafts for a 5-year-old boy, building blocks, colored pencils, Barbies, play dishes and food, hats, gloves and scarves. Please sign up for the items your family would like to bring. The sign-up sheet will be under the tree after ATTACK time today. All items MUST be here by December 6. You can bring your donations to Mrs. Wontor's room. Let's work together to make someone's Christmas especially merry this year. Youth wrestling sign-up for all 3rd – 5th grade boys and girls will be Thursday, December 6th at 6 p.m. in the multi-purpose room. For all 4K-2nd grade boys and girls it will be Thursday, January 10th at 7 p.m. also in the multi-purpose room. Brick orders have been rolling in over the holiday weekend! Don't miss out on this opportunity to place yours! Personalized bricks are a great way to recognize a team/club, commemorate a special event, or celebrate a graduate/graduation year. Attached are a couple examples of bricks that have been purchased, thus far. To place your order online go to https://www.thatsmybrick.com/ithacawi or pick up an order form in the office. Our app is in the Google App (play store) and Apple App store as "Ithaca School District" and will have the following ICON to click on. Ithaca has a new App. We will be able to send out school closings, delays, and reminders about teacher inservice. Consider placing it on your phone and then sit back and get messages. Come one, come all! It's time for the 2nd Annual PTSO Gingerbread House building contest! It will be held Saturday, December 1 starting at 5:30 in the Commons. Frosting, graham crackers, and milk cartons to support your creation will be provided - families/groups need to bring decorations - enough to share please - and a base to build your house on like a cookie sheet or a piece of cardboard wrapped in aluminum foil. Judging will be at 6:45 with prizes for the 1st, 2nd, and 3rd place creations. Hope to see you at this FREE event! Attn Students in grades 3-12: There will be a Game Club night on Thursday, November 29 from after school until 5 PM. Meet in the commons after school for a healthy snack and then we will go to the Multi-purpose room. This is where you can be picked up at 5 PM. Elementary students please fill out the permission form and get it back to your teacher by Tuesday the 27th please. Youth wrestling sign-up for all 4K-2nd grade boys and girls will be Thursday, January 10th at 7 p.m. in the multi-purpose room. Attn students in grades 3-12: There will be a Game Night on Thursday, November 29th, from after school until 5 PM. Meet in the Commons after school for a healthy snack and then we will go to the Multi-purpose room. This is where you can be picked up at 5 PM. Elementary students please fill out the permission form and get it back to your teacher by Tuesday, the 27th, please. The annual food drive put on by your Student council and the NHS is soon to be underway. This year we are making the food drive a school wide event. The top 3 classes throughout the elementary, middle, and high school who collect the most pounds of food will get a pizza party during lunch. That’s right, high school and middle school students, can you collect more than our elementary classrooms? Along with these changes, water will not be accepted as a donation. Thank you for your support and donations to the needy people in our community! This group attended the Improv Event for G/T at CESA 3 this past week! They enjoyed it immensely! Reminder! The Ithaca FFA Fall Blood Drive is this Wednesday, Nov. 21st. Please sign up with Mr. Favreau or in the office. All students 16 years old and older are eligible to donate. And don't forget...Give a Pint and Get a Pint of Culver's Custard! FBLA would like to thank all of you who purchased donuts on Friday. We sold out and made almost $200 for the March of Dimes. Again, thank you for your support!!! Starting in 30 minutes! You still have time to join us. The Middle School Student Council will be hosting a Middle School Dance tonight from 6-9 p.m. in the Old Gym. General admission is $3.00 or $2.00 if you bring a donation for the food pantry. We hope to see you there! Support Ithaca Wrestling and show your bulldog pride with Ithaca Wrestling performance apparel. Order forms are by the Mezzanine door All order forms are due Wednesday November 21st. Please feel free to share this post/tweet - THANKS! Band Students: Have you sold all of your calendar raffle tickets? If not, there are many students who need more to sell. Please turn them into Mrs. Moser if you are not going to sell them. Don't be the one to bring in unsold tickets at the end of the month. Support Ithaca Basketball with some custom apparel! Proceeds go towards the basketball program. Pick up an order form that can be found on Mrs. Clary’s, Mr. Klang’s, and Mr. Mezera’s door. Order forms are due on WEDNESDAY, NOVEMBER 21ST. Reminder! The Ithaca FFA Fall Blood Drive is Wednesday Nov 21st. Please sign up with Mr. Favreau or in the office. All students 16 years old and older are eligible to donate. And don't forget...Give a Pint and Get a Pint of Culver's Custard! The Middle School Student Council will be hosting a Middle School Dance tonight from 6-9 p.m. in the Old Gym. General admission is $3.00 or $2.00 if you bring a donation for the food pantry. We hope to see you there! The Ithaca FFA Fall Blood Drive is Wednesday Nov 21st. Please sign up with Mr. Favreau or in the Office. All students 16 years old and older are eligible to donate. And don't forget...Give a Pint and Get a Pint of Culver's Custard! Attention please: The yearbook staff is finalizing the senior pages. We need your Sr. pictures, baby pictures and Then and Now pictures if you have not submitted them already. Hey everyone, join us tomorrow night! The Middle School Student Council will be hosting a Middle School Dance on tomorrow, November 16 from 6-9 p.m. in the Old Gym. General admission is $3.00 or $2.00 if you bring a donation for the food pantry. We hope to see you there! The November PTSO meeting will be next Wednesday, November 21 at 3:30 in the LMC. Free babysitting will be provided. We hope to see you there! 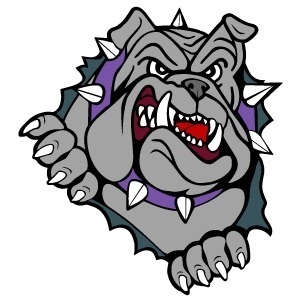 There will be a purple-white scrimmage for our JV and Varsity boys basketball teams tonight from 6-8 PM. Those in attendance will receive a T-Shirt (while supplies and sizes last). All are invited to cheer on the Bulldogs during this free event! Attention NHS members: Please do not forget to bring your goodies for the NHS induction ceremony tomorrow night. You can bring them to Mrs. Wontor's room before school if you would like. Remember, attendance at the ceremony is mandatory for all NHS members. See Mrs. Wontor if you have any questions. Thank you! Notice! The Young Entrepreneurs will be selling micro greens to teachers and community members after school on Tuesdays, starting Nov. 13. Free samples and order form sheets areavailable on that day. Notice to seniors: The yearbook staff is finalizing the senior pages. We need your Sr. pictures, baby pictures and Then and Now pictures if you have not submitted them already. Attention NHS members: Please do not forget to bring your goodies for the NHS induction ceremony tomorrow night. You can bring them to Mrs. Wontor's room before school if you would like. Remember, attendance at the ceremony is mandatory for all NHS members. One week from today! The Ithaca FFA Fall Blood Drive is next Wednesday, Nov 21st. Please sign up with Mr. Favreau or in the Office. All students 16 years old and older are eligible to donate. And don't forget...Give a Pint and Get a Pint of Culver's Custard! Support Ithaca Basketball with some custom apparel! Proceeds go towards the basketball program. Pick up an order form that can be found on Mrs. Clary’s, Mr. Klang’s, and Mr. Mezera’s door. You can also order online at www.idoshirts.com >>> Online Stores >>> Click on Ithaca Girls’ Basketball icon to shop. Order forms are due on WEDNESDAY, NOVEMBER 21ST. Online orders are due by Monday, November 26th. There will be a purple-white scrimmage for our JV and Varsity boys basketball teams this Thursday night from 6-8 PM. Those in attendance will receive a T-Shirt (while supplies and sizes last). All are invited to cheer on the Bulldogs during this free event! The yearbook staff is finalizing the senior pages. We need your Sr. pictures, baby pictures and Then and Now pictures if you have not submitted them already. The wrestling team is looking for anyone interested in being a manager for this season. If anyone is interested contact Coach Kelly or Coach Clary. Reminder! We have an early release today for PLC. Students will be released at 1:10pm. Our safety drill went very well today. We were thankful for the law enforcement and observers who were able to give advice on how to do things better and what went very well. Thank you to all involved! Just a reminder that next Wednesday, November 21, there will be a PTSO meeting in the LMC at 3:30 p.m. Free babysitting will be provided. Fresh lettuce and micro greens are here! The young entrepreneurs will be selling micro greens to teachers and community members after school on Tuesday’s. Free samples and order form sheets will be available on that day. Juniors. You need to sign up for concessions! There is only 1 person signed up for next Tuesdays Girls basketball game. If no one signs up, we will have to give this great fundraiser to another group. SIGN UP! The Middle School Student Council will be hosting a Middle School Dance on Friday, November 16 from 6-9 p.m. in the Old Gym. General admission is $3.00 or $2.00 if you bring a donation for the food pantry. We hope to see you there! Fresh lettuce and micro greens coming soon! The young entrepreneurs will be selling micro greens to teachers and community members after school on Tuesday’s, and starting Nov. 13. Free samples and order form sheets will be available on that day. Support Ithaca Youth Wrestling and show your Bulldog Pride with performance apparel. Check out order forms that are by the Mezzanine door on the Ithaca Campus. 6th - 12th Grade Band Students: If you are unable to sell your Calendar Raffle Tickets, please give them back to Mrs. Moser this week so that other students can sell them. Some students are in need of more tickets already. Thank you! Just one week away! The Middle School Student Council will be hosting a Middle School Dance on Friday, November 16 from 6-9 p.m. in the Old Gym. General admission is $3.00 or $2.00 if you bring a donation for the food pantry. We hope to see you there! November 11th is Veterans Day. This observance day began in 1919 as Armistice Day to commemorate the end of World War 1. In 1954, President Dwight D. Eisenhower signed legislation changing Armistice Day to Veterans Day, “a day dedicated to world peace.” The day honors all veterans of the U.S. armed services. The annual Veterans Day Program will be held today at 1:30 PM in the Ithaca gymnasium. All are welcome to attend. HS Boys Basketball players make sure all paperwork is complete and turned in. Turn in parent meeting slips to Mr. Mezera- you won't be able to practice if they are not turned in. Also if you have a practice jersey from the summer, please bring it to practice on Monday, Nov. 12 at 6 AM. There will be a sign-up for youth basketball tonight at 6:30 in the Commons for boys and girls in grades 1st-6th interested in playing basketball this year. Fresh lettuce and micro greens coming soon! The young entrepreneurs will be selling micro greens to teachers and community members after school on Tuesday’s starting Nov. 13. Free samples and order form sheets will be available on that day. There will be a FCCLA organizational meeting for Middle school and High school students on Thursday, November 8 during ATTACK time in Ms. Sprecher's room. Snacks will be provided. Come see what FCCLA is all about. The Ithaca Foundation's Trivia Night is Friday, November 9 starting at 7 PM in the school commons. $25 per team with no more than 8 people per team please. Contact Rob Richards to enter your team today at 608-585-2137 or via email at rob@richardsinsure.com by today. Just a reminder: A Financial Aid/FAFSA Workshop will be held TONIGHT at UW Richland at 6:00p.m. Please RSVP to Stephanie Joyce if you are planning to attend. Mark your calendars! The Elementary Winter Concert date has been finalized for Tuesday, December 18th, at 1:00 PM. The make-up/ snow date is December 21st. The Ithaca Foundation's Trivia Night is back on Friday, November 9 starting at 7 PM in the school commons. Cost is $25 per team with no more than 8 people per team please. You may bring your own snacks - popcorn and beverages will be sold and a silent auction will take place as well. Contact Rob Richards to enter your team today at 585-2137 or via email at rob@richardsinsure.com by November 7. Congratulations to the Ithaca WIHA team for competing at state in Madison over the weekend. Spanish I and Spanish II students made "ofrendas" ,or altars, for Day of the Dead. Day of the Dead is celebrated in Mexico and some Central American countries on November 1st and November 2nd. The altars are a method for families to celebrate and remember the lives of family and friends that have died. The students made beautiful "ofrendas" for Dia de los Muertos! There will be a sign-up for youth basketball on Thursday Nov. 8th at 6:30 in the Commons for boys and girls in grades 1st-6th interested in playing basketball this year. Attention Ithaca parents and students: If you are interested in ordering a Letter Jacket the cost is $250.00. Orders will be due on November 9. Please see Mrs. Moser for an order form. There will be a high school girls’ basketball parent/player/coach meeting on Monday, November 5th at 6:00 pm right after practice. Tuesday, the 2nd grade classes went to the Akey School for a field trip. 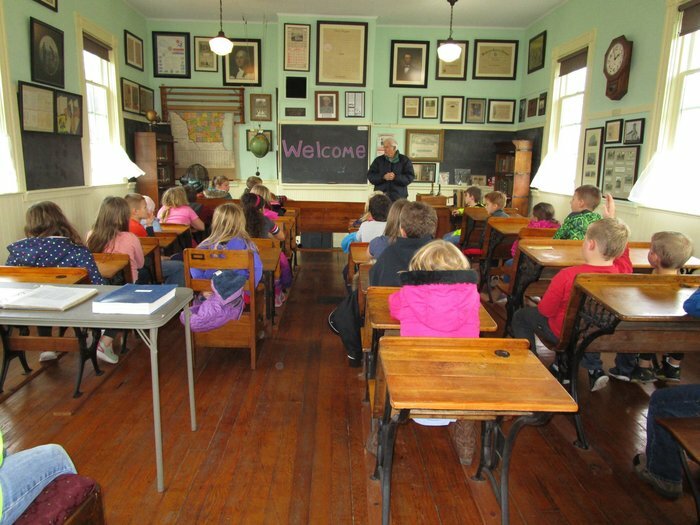 They got to experience a little of what it was like to be taught in a one-room school house. It was a GREAT Halloween in Ithaca! Fellowship of Christian Athletes will hold their 'Huddle' this morning 7:00am. ALL MS and HS students are welcome to attend! Start the day with some encouragement & enjoy a breakfast together! We meet in the FACE room. Hope to see you and invite a friend! AED and CPR training will NOT be held as scheduled. It was to be held Thursday November 1, 2018. Please help "Pave the Patio" by donating a brick for the new outdoor learning/recreation area. 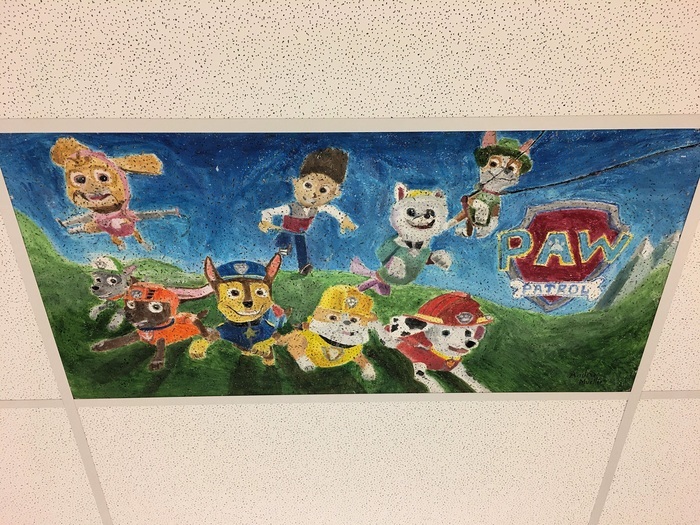 http://www.thatsmybrick.com/ithacawi or contact Jenna Wipperfurth at Ithaca School to have your special idea remembered forever! Don't delay - orders are due on November 2. Always great to see Rambo at the school. Stop by and visit ANY TIME! 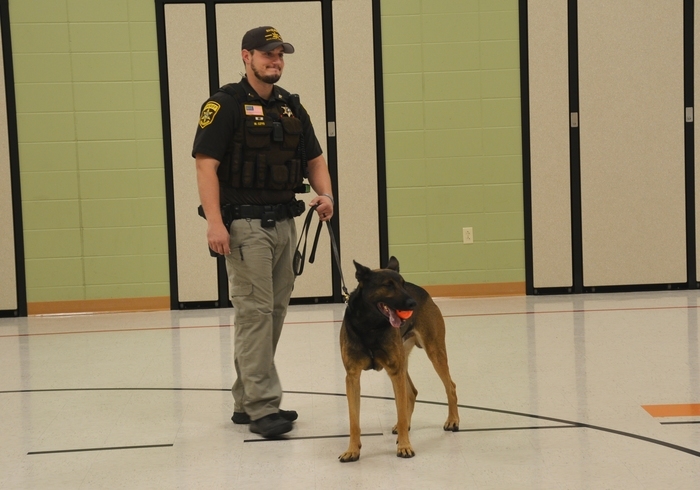 Officer Cysz and K-9 Rambo came to visit the elementary students/staff today! There is a boys basketball signup sheet outside of Mr. Mezera's room for any high school boys who are interested. A mandatory parent/student/coach meeting will be held on Monday, November 5th at 6:15. Fellowship of Christian Athletes will hold their 'Huddle' this Thursday morning 7:00am November 1st! ALL MS and HS school students are welcome to attend! we share devotion, fellowship & enjoy a breakfast together! We meet in the FACE room. Hope to see you and invite a friend! The Ithaca Foundation's Trivia Night is back on Friday, Nov 9 starting at 7 PM in the commons. Cost is $25 per team with no more than 8 people per team please. Contact Rob Richards to enter your team at 585-2137 or via email at rob@richardsinsure.com by November 7. Jostens will be at Ithaca on Thursday, November 1st during attack time to take orders for senior caps and gowns and freshmen class rings. There will be a High School Wrestler and parent meeting Wednesday night, Oct. 31th at 7:00 at the Loyd Community building. In December 1990, Ithaca School District teachers Bob Pilla and Jean Nugent organized the then Senior Class to sponsor a food drive throughout Ithaca School and Community to benefit Passages. That tradition is still carried on today, 28 years later. We are launching soon - stay tuned for website and APP details.